Happy New Year! ​ ​As mentioned last month I`ve included a link to the excellent ADS-B Exchange website which can be filtered to show Military aircraft only. Combined with Flightradar 24 which tracks mainly civil aircraft, this enables real-time tracking of the vast majority of flights in UK airspace. 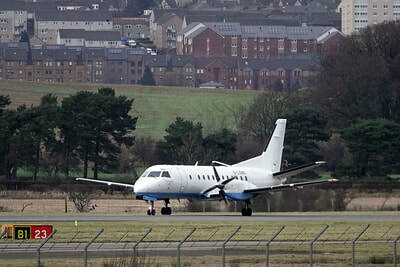 Some fighters and other restricted flights still aren`t shown on ADS-B but many front-line jets, most military transports including VIP aircraft, maritime patrol, trainers and helicopters usually are. 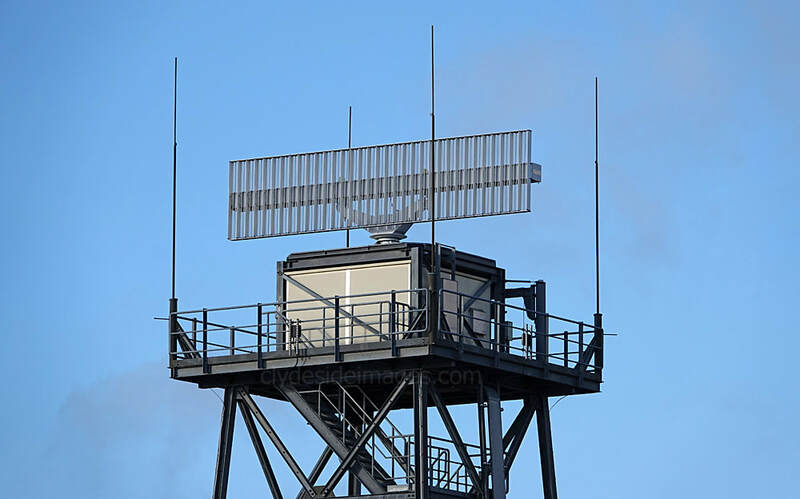 For anyone unfamiliar with ADS-B, just click the blue radar icon on the right hand side of the screen for the live map. 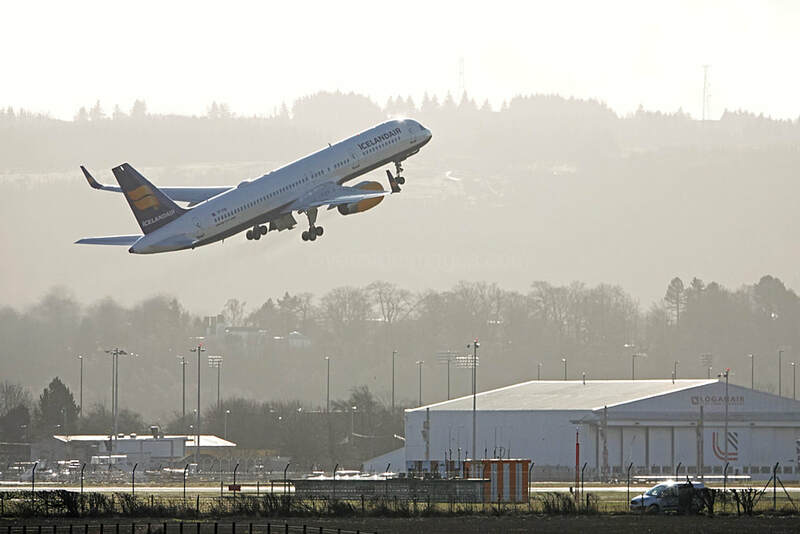 Glasgow International recorded its busiest ever year in 2017 with more than 9.9 million passengers transiting the airport which represents an annual increase of 5.8%. 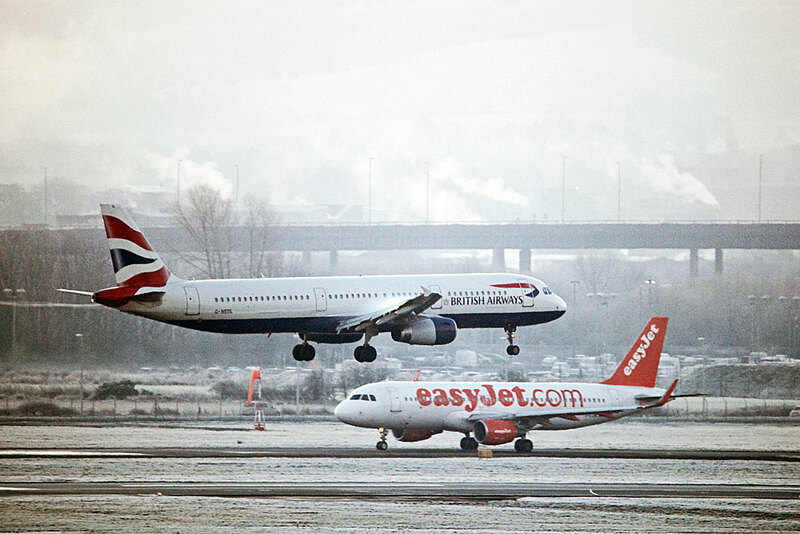 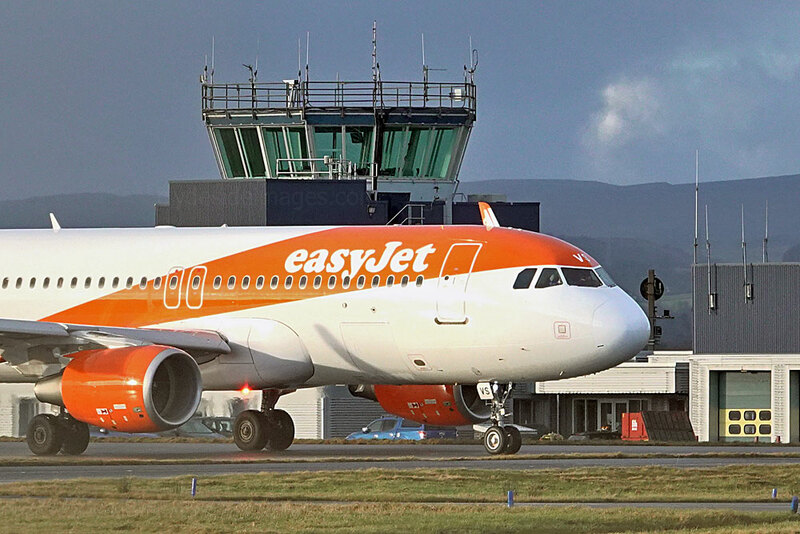 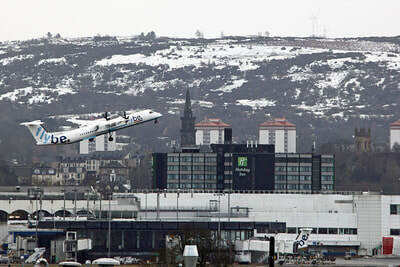 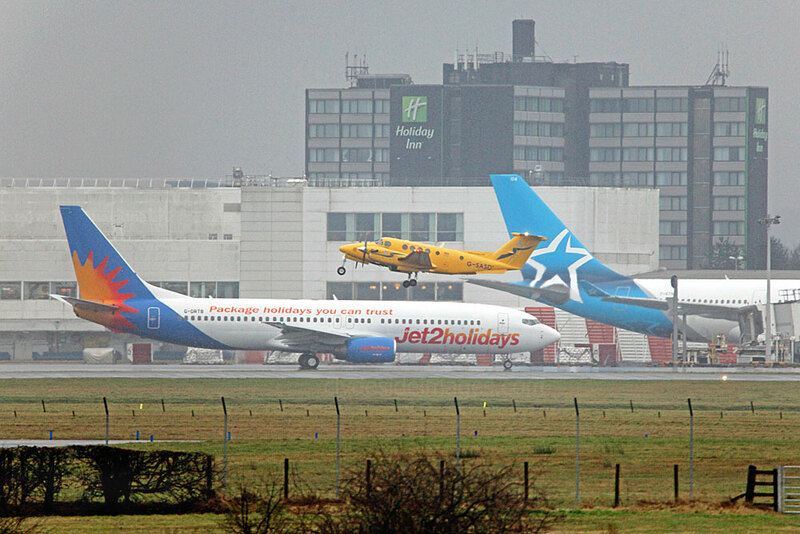 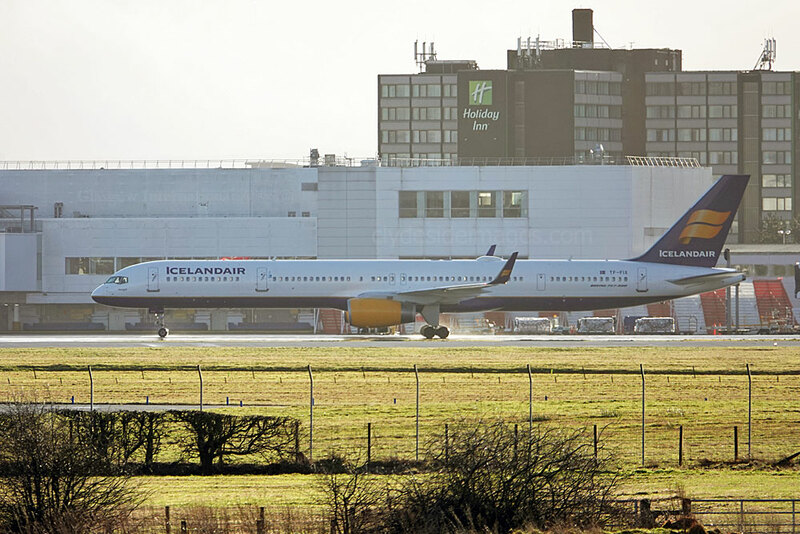 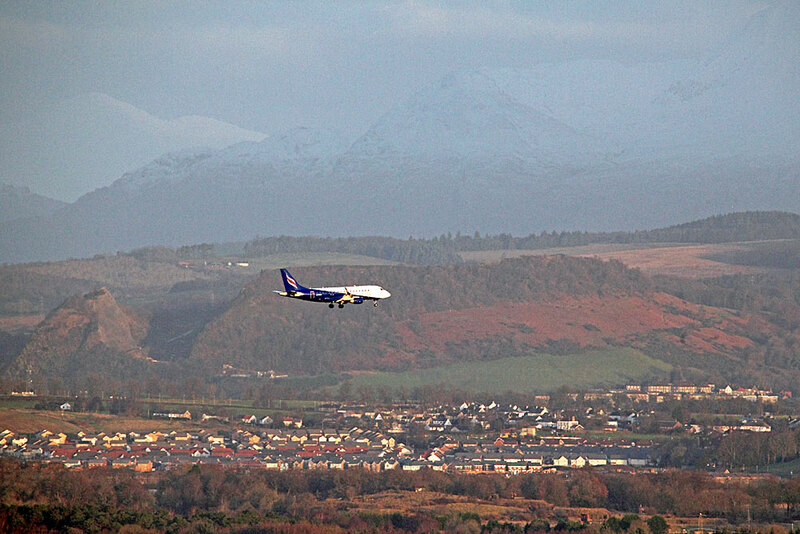 More than 13 million travellers used Edinburgh Airport during the same period which was also a record and Aberdeen saw 3.1 million passengers, which equates to a 1.8% rise on the previous year, although this figure wasn`t an all-time high. ​These increases came despite concerns over Brexit - the UK`s impending break from the European Union in March 2019, and adverse weather which affected airports at the beginning and end of last year. 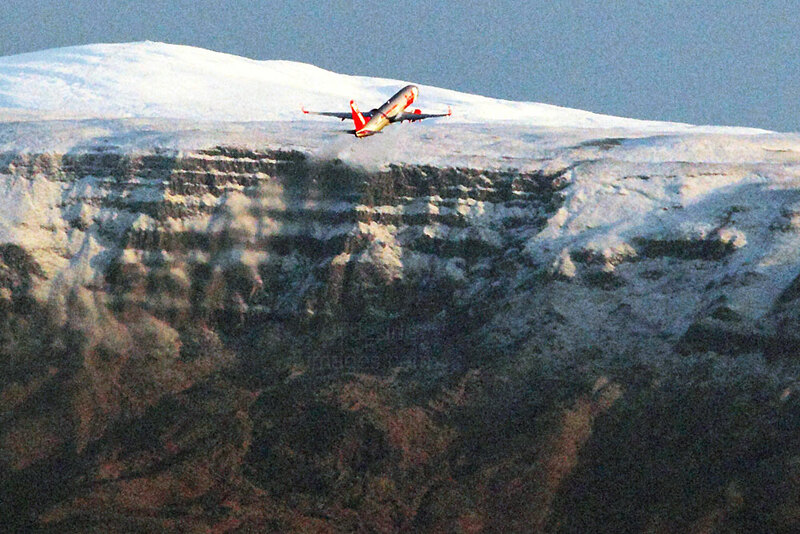 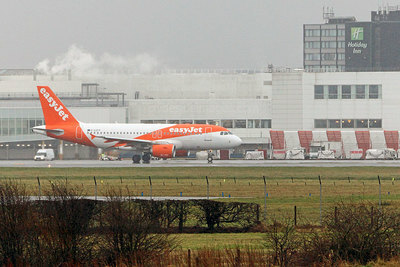 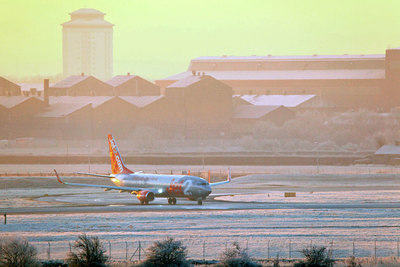 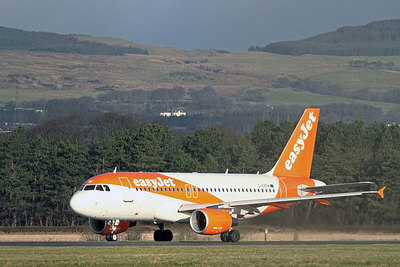 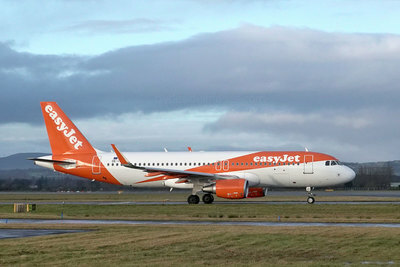 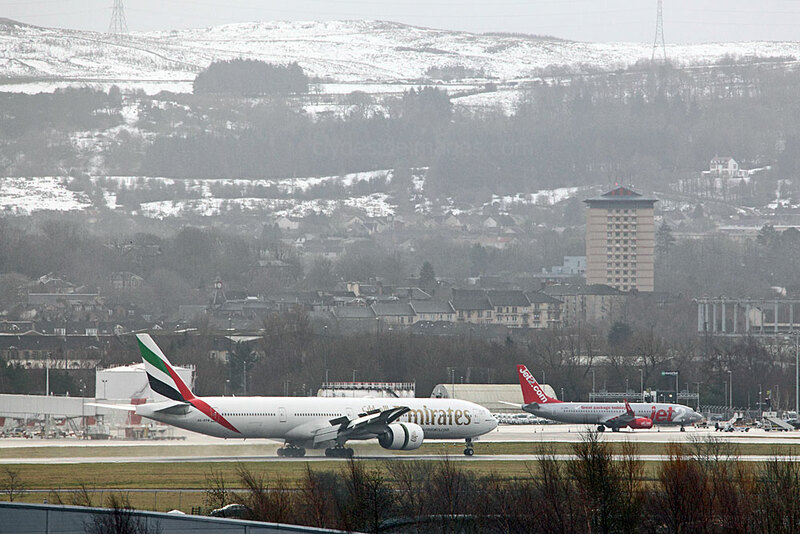 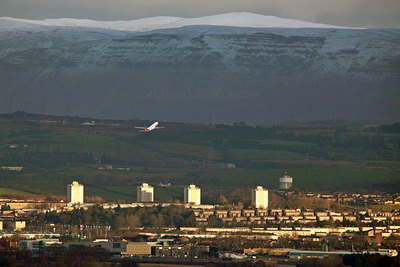 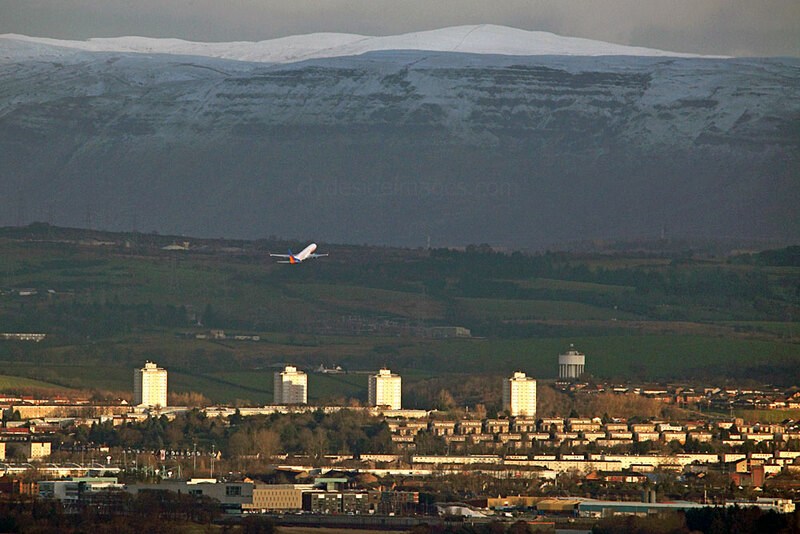 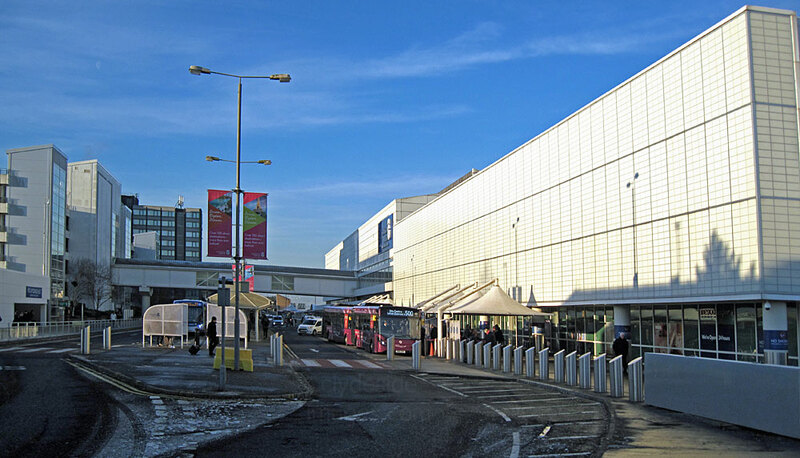 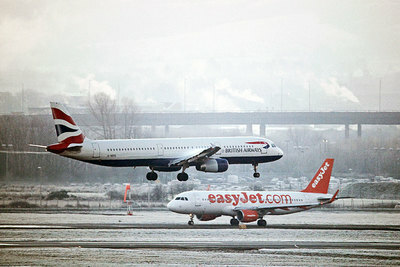 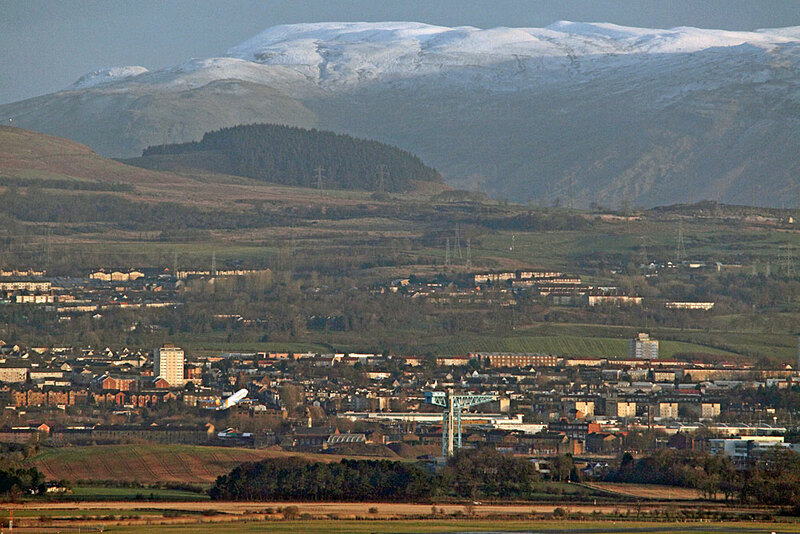 Glasgow Airport reported dealing with 9,902,239 passengers from January to December 2017, with 618,131 passing through the hub just last month alone, however, wintry conditions including the area`s first significant snowfall in recent years, resulted in a marginal -1.5% decrease on passenger numbers compared with the same period in 2016. 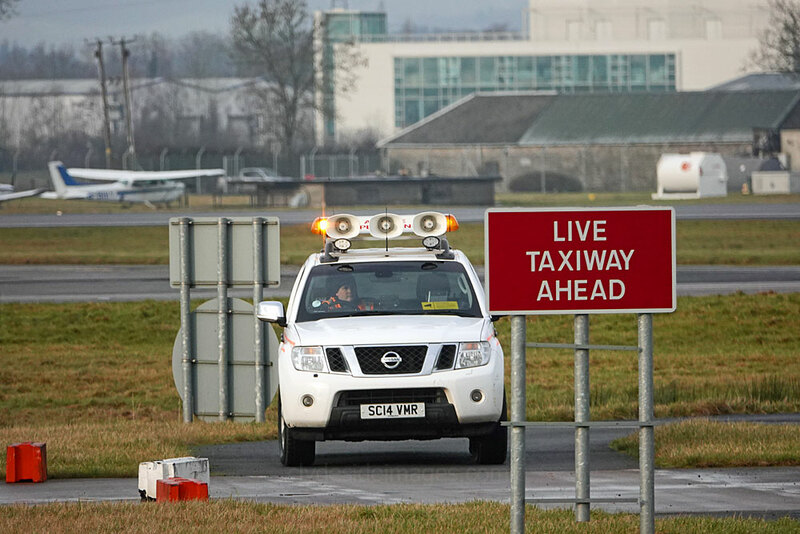 This went against the trend which saw the airport management team report record monthly figures throughout 2017, a remarkable achievement. 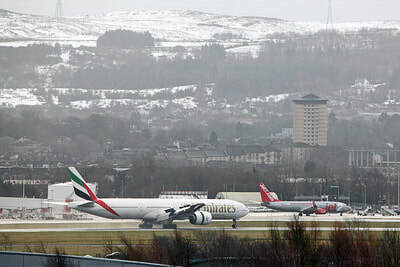 ​Managing Director Amanda McMillan will be moving on soon, with her replacement due later this year so it will be interesting to see whether a change at the top can keep Glasgow International`s future looking bright, especially with regards to the political and financial uncertainties that lie ahead and their potential impact on the travel industry. 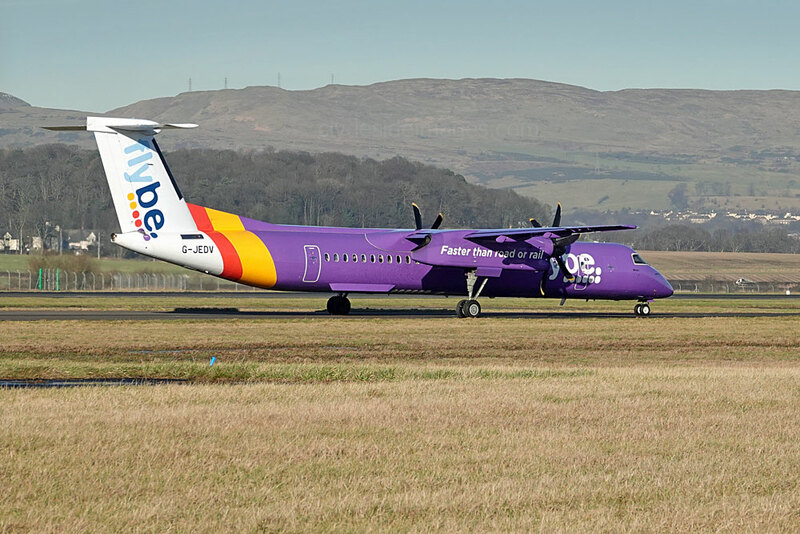 It was confirmed by AGS Airports Ltd, which owns Aberdeen International, Glasgow and Southampton airports, that Derek Provan will succeed Ms McMillan as both Chief Executive Officer of AGS and Managing Director of Glasgow Airport. 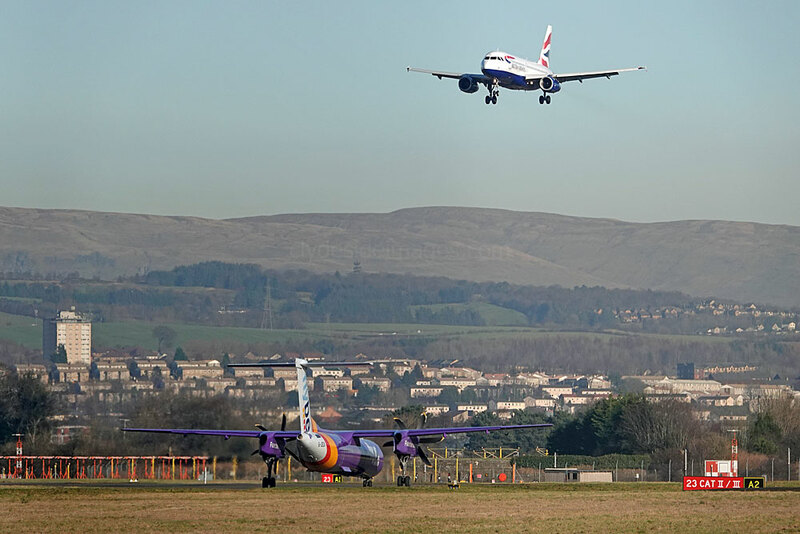 Glasgow-born Mr Provan has over 20 years of experience in aviation and joins AGS from Heathrow, Europe’s largest airport, where he is currently Interim Chief Operating Officer. 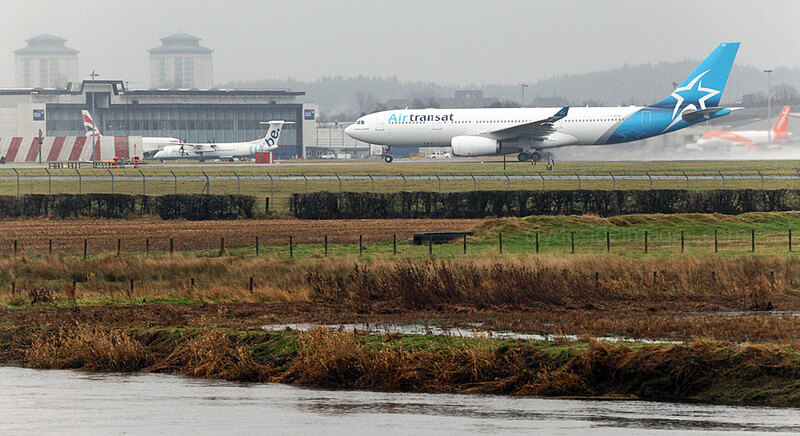 More information on the appointment can be found on the official Glasgow Airport website. 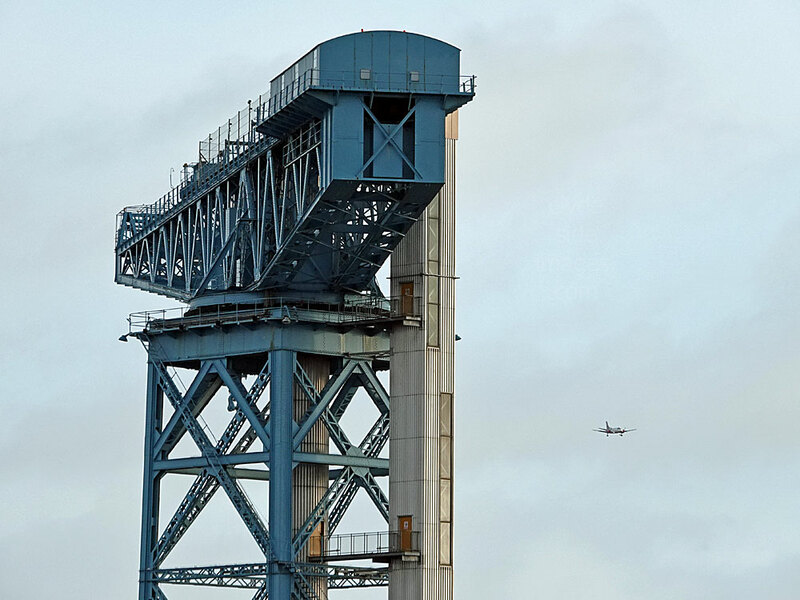 A number of recommendations have been made including the decommissioning of current ground-based navigation aids in favour of satellite systems by the end of 2019. 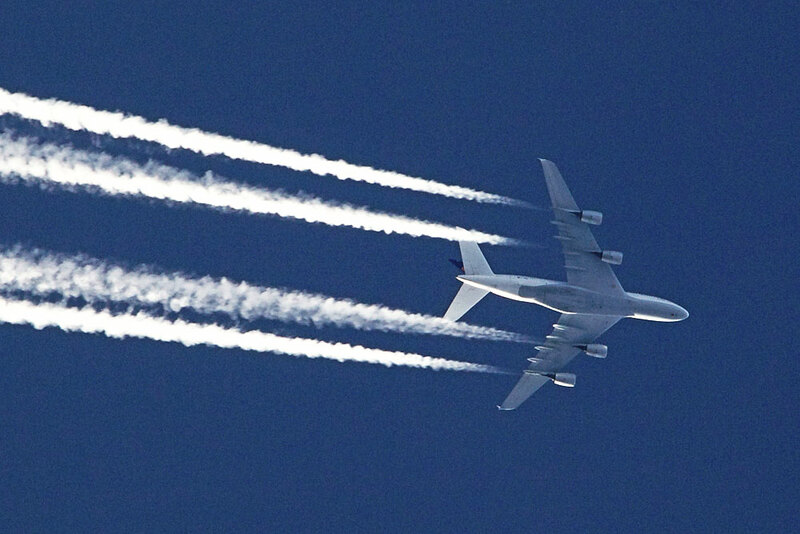 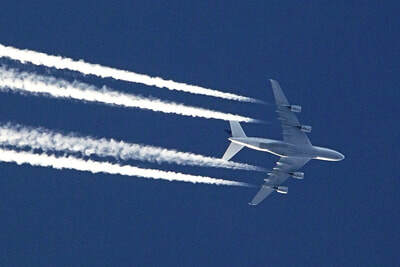 ​​Supporters say the move to satellite systems will improve the punctuality of flights and enable aircraft to fly more efficient, reliable and direct routes while reducing overall CO2 and fuel emissions by 21% (12,910 tonnes). The proposed changes relate to departing traffic only, i.e. 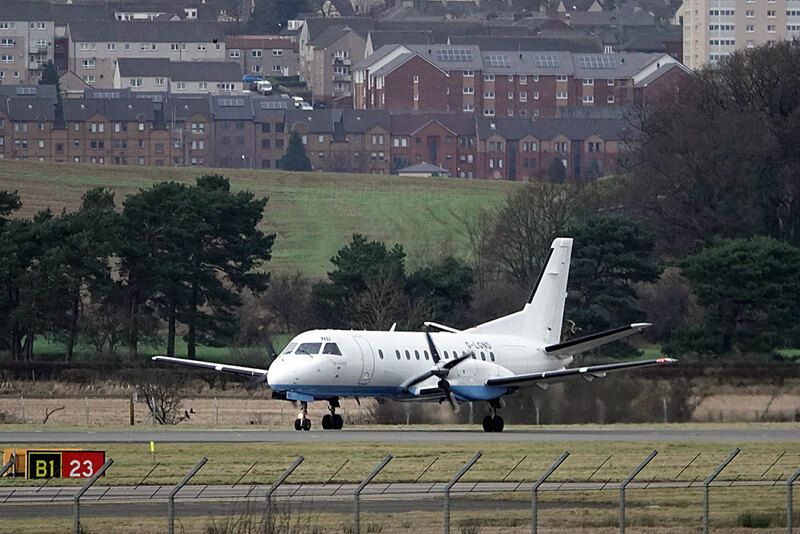 those that are on Standard Instrument Departures, more often referred to as SID routes. 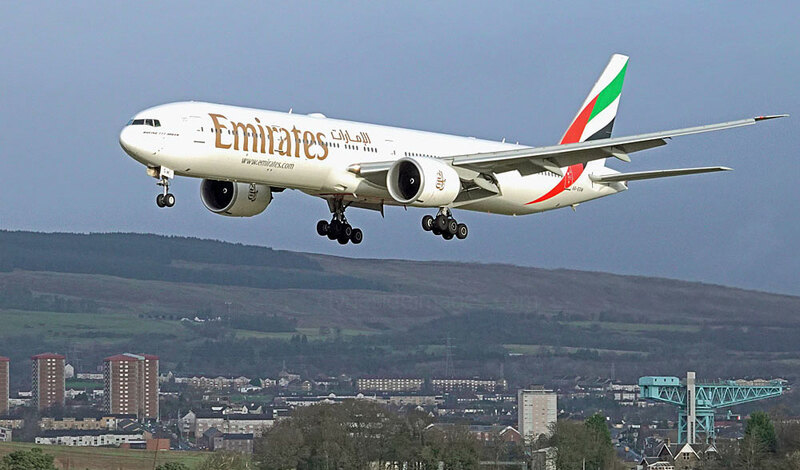 SIDs, also known as Departure Procedures (DP), are published flight procedures followed by aircraft on an Instrument Flight Rules (IFR) flight plan immediately after takeoff. 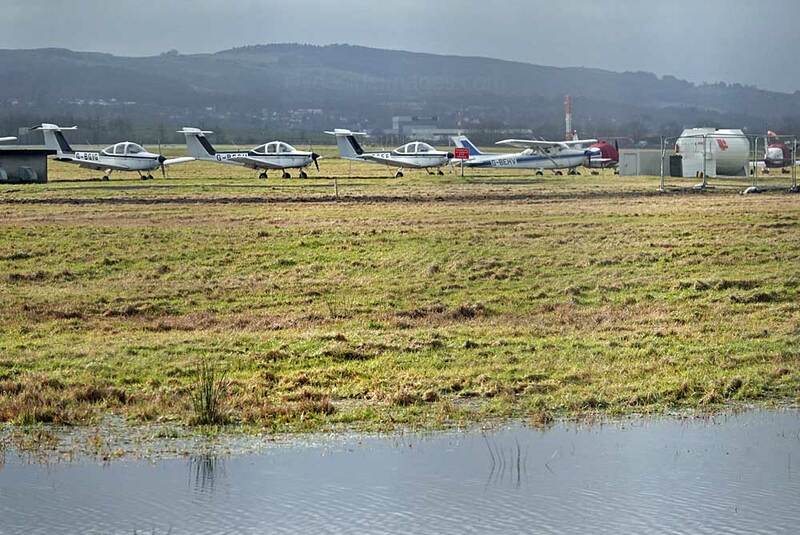 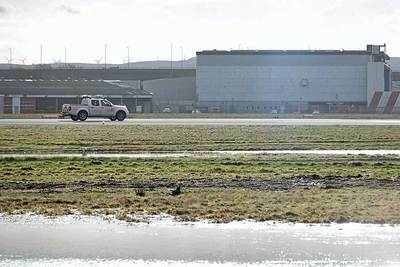 Airport authorities will hold a number of drop-in sessions in the areas likely to be affected over the course of the coming months and all views will then be presented to the regulator, the CAA, before the necessary approval can be granted. 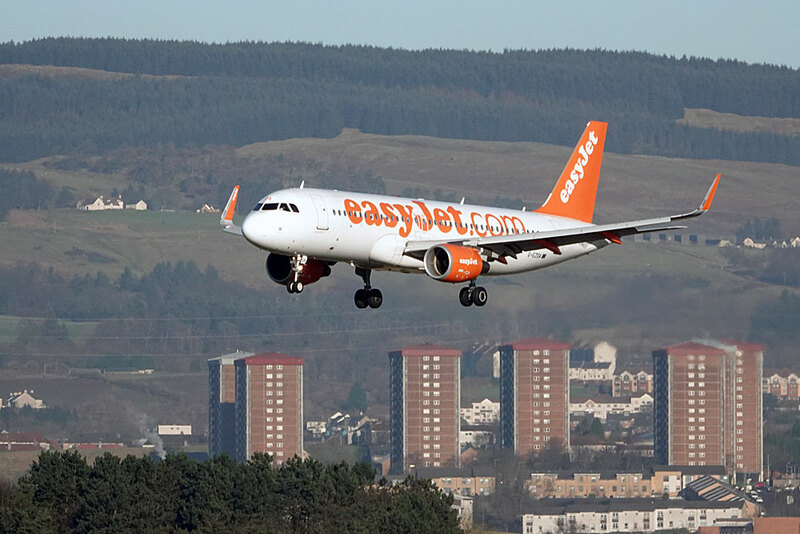 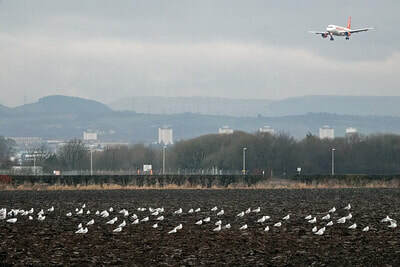 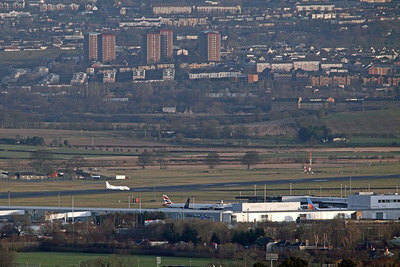 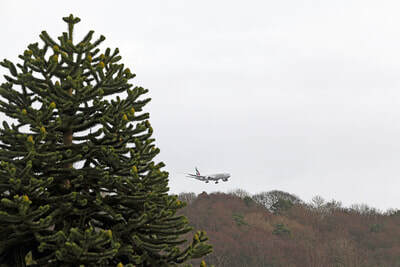 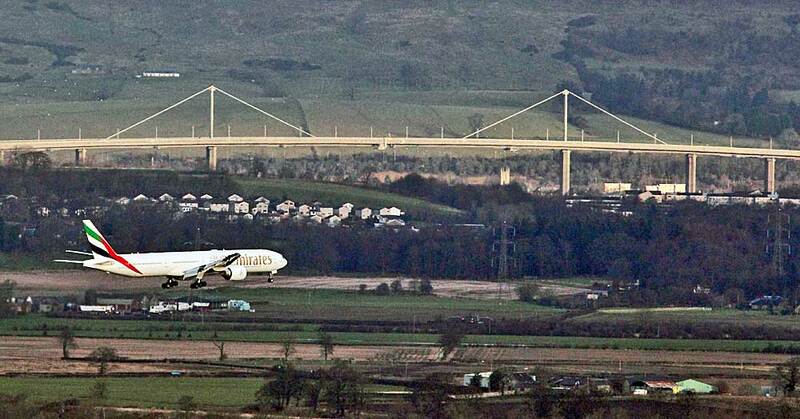 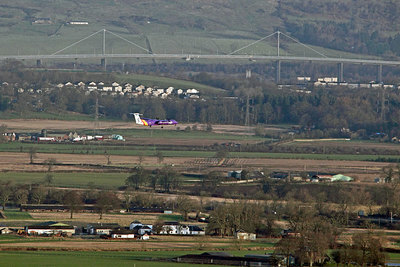 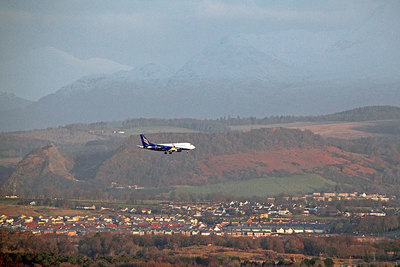 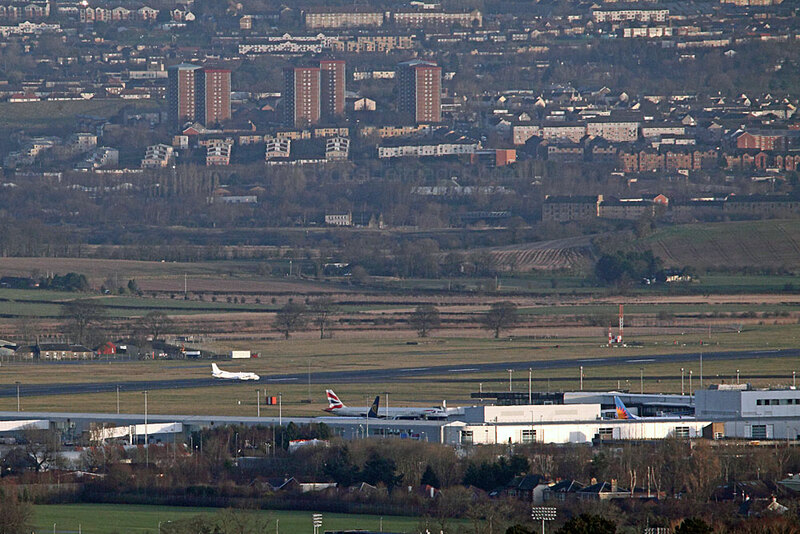 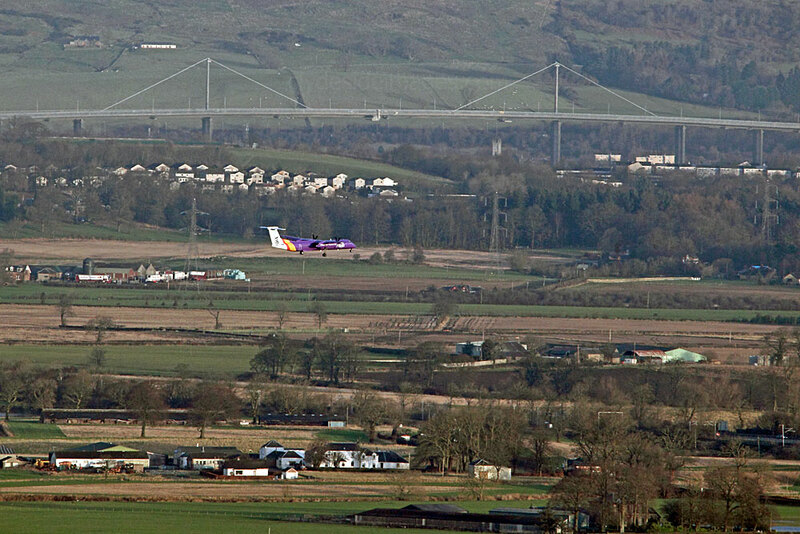 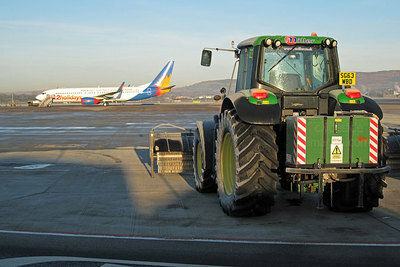 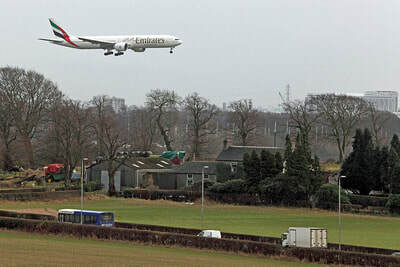 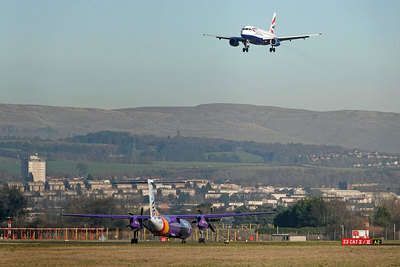 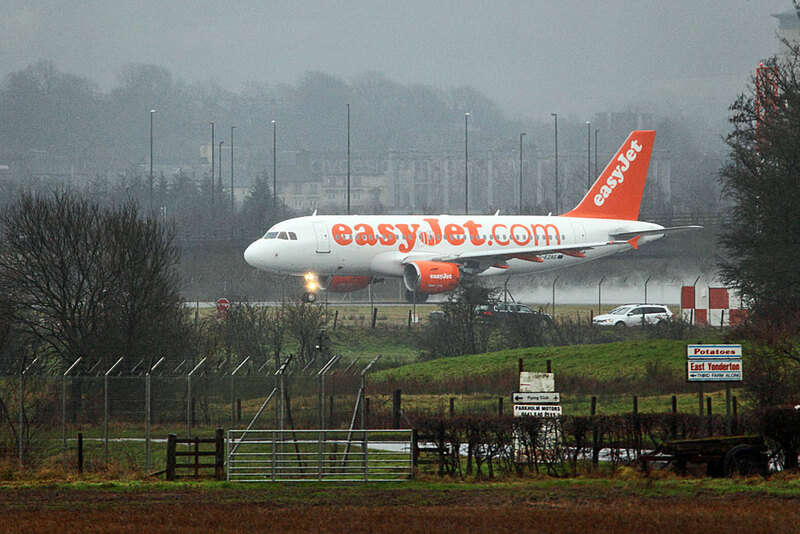 Recent attempts to change Edinburgh Airport's flight paths sparked opposition from local communities concerned about noise pollution. 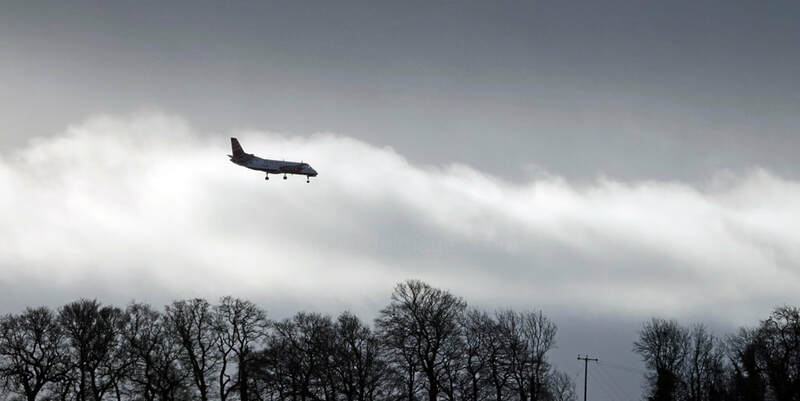 The first spell of bad weather to affect the UK this year was Storm Eleanor which struck in the early hours of Wednesday 3 January with gusts reaching 100mph (161kph). 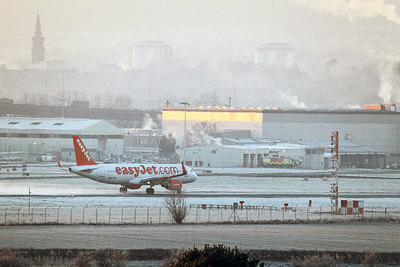 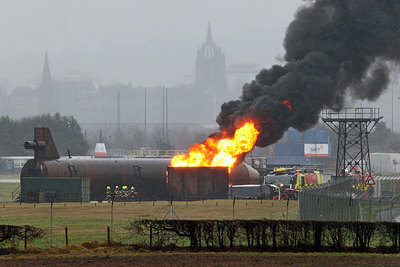 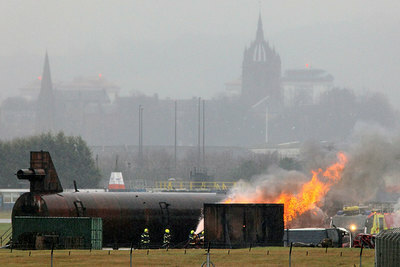 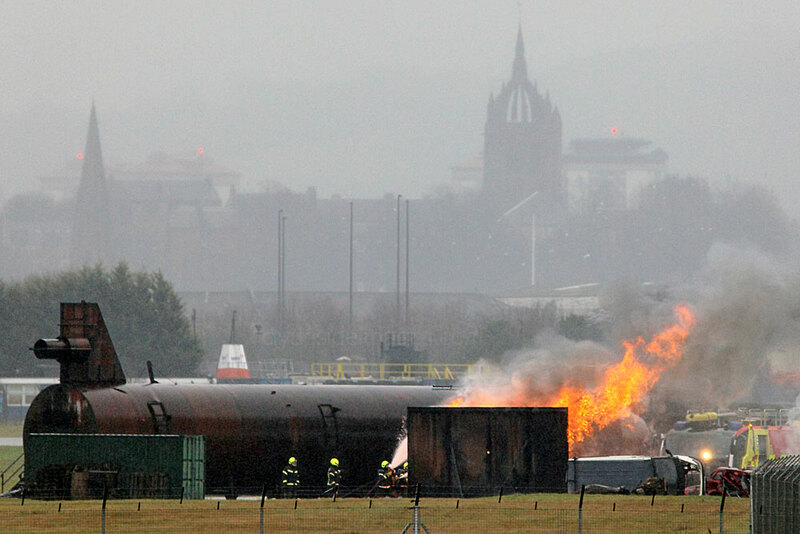 Although the Glasgow area missed the worst of it, parts of southern Scotland, England, Wales, and most of Northern Ireland, experienced numerous road closures, delays on public transport and thousands of homes left without power. 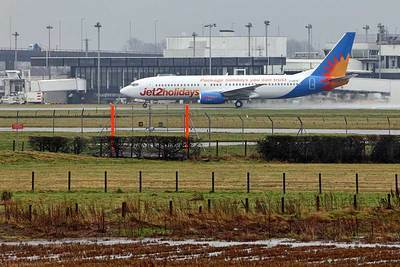 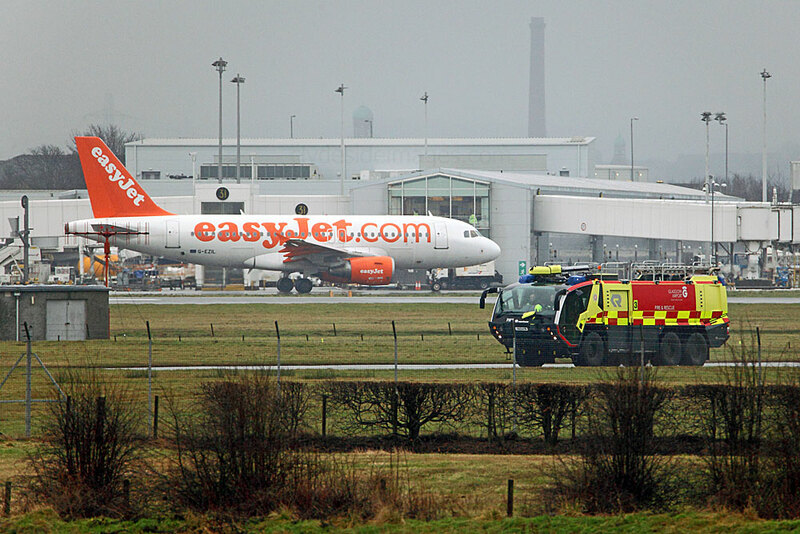 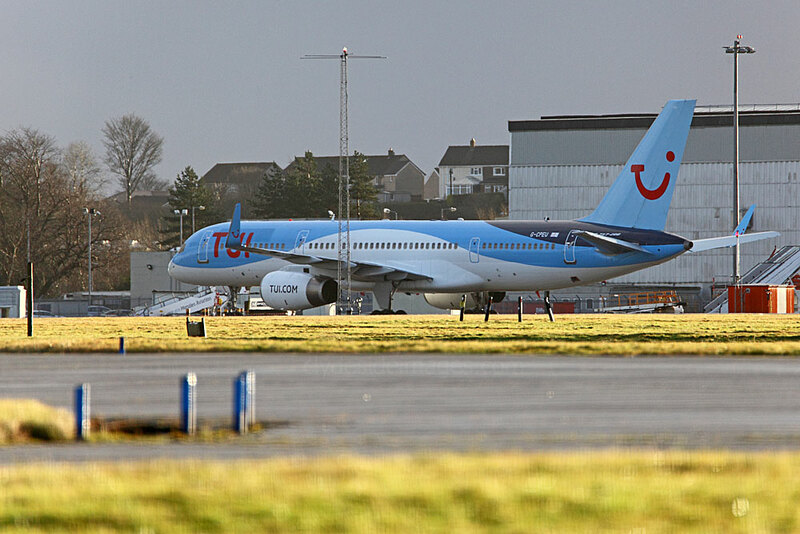 The storm continued eastward forcing Dutch carrier KLM to cancel a number of flights between Amsterdam Schiphol and London Heathrow, plus routes between the Netherlands and Manchester, London City, Leeds Bradford and Southampton airports all experienced delays. 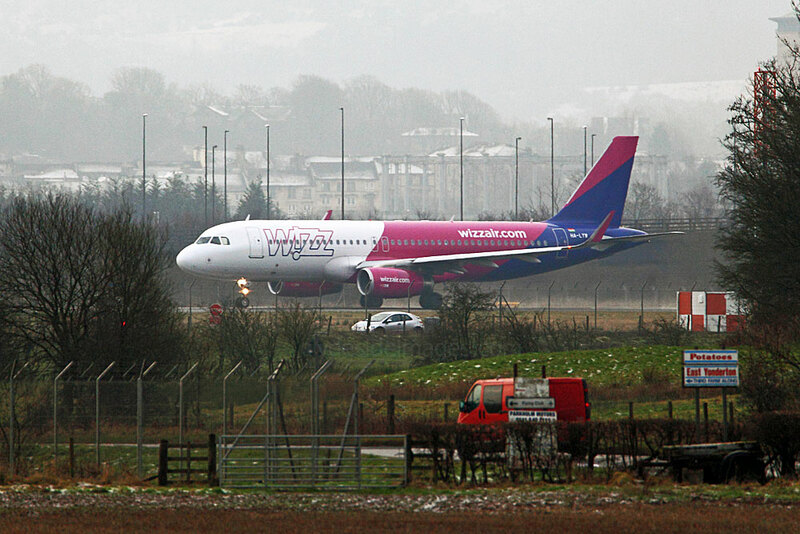 This Manchester Airport diversion, which landed at 06:45 hrs on Wednesday 3 January, was my first aircraft snapped in 2018. Federal Express Boeing 757-23A(SF) N939FD parked on Stand 82 and remained on the ground here until 19:50 hrs before heading south. 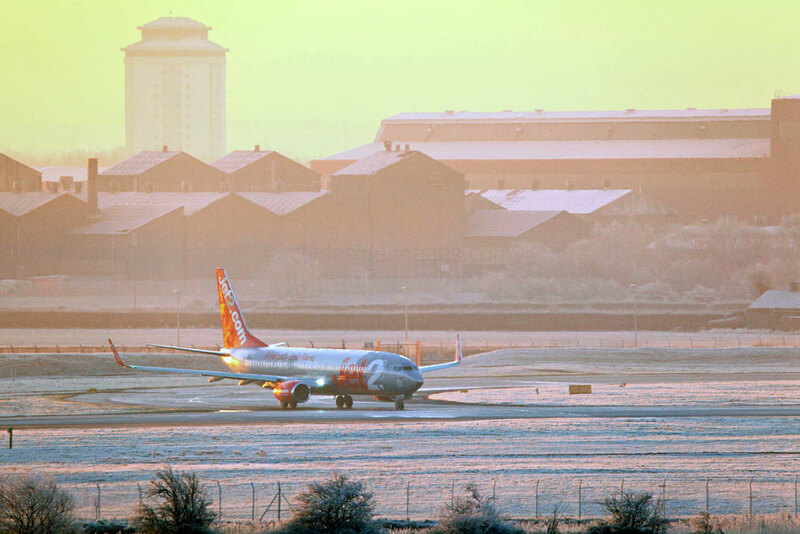 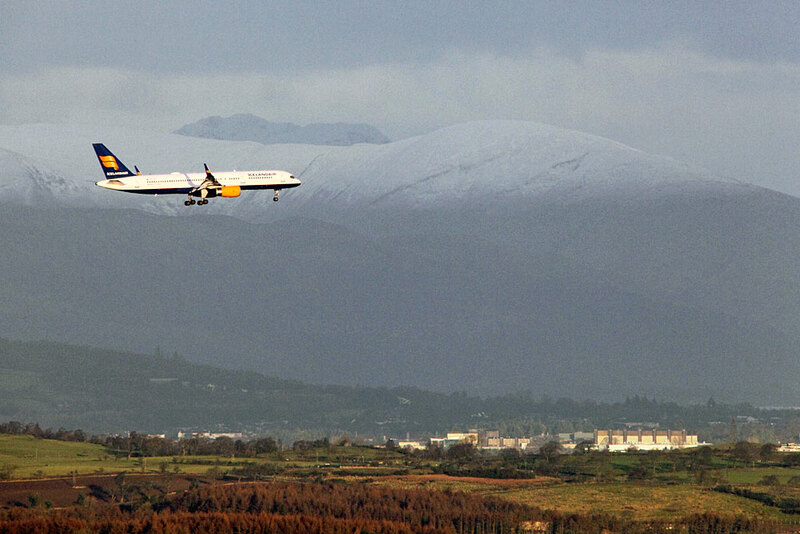 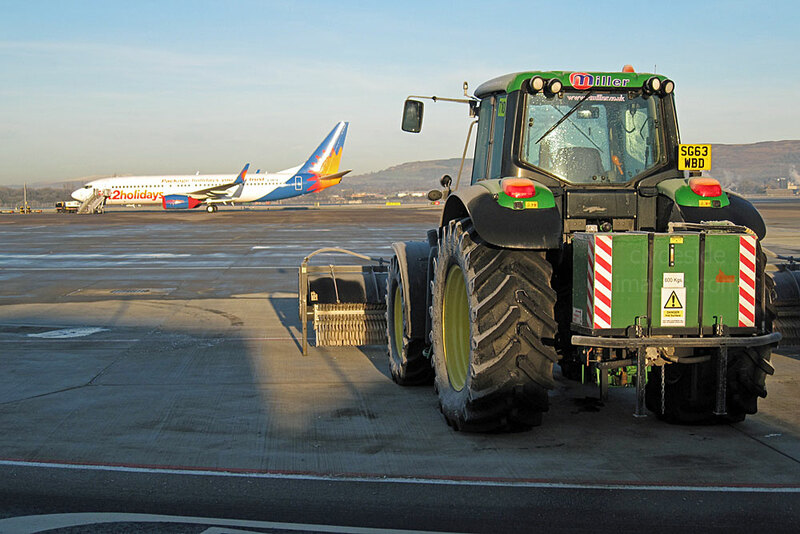 It wasn`t until the middle of the month that Scotland experienced significant snowfall ​but once again, operations at Glasgow Airport were only slightly affected. 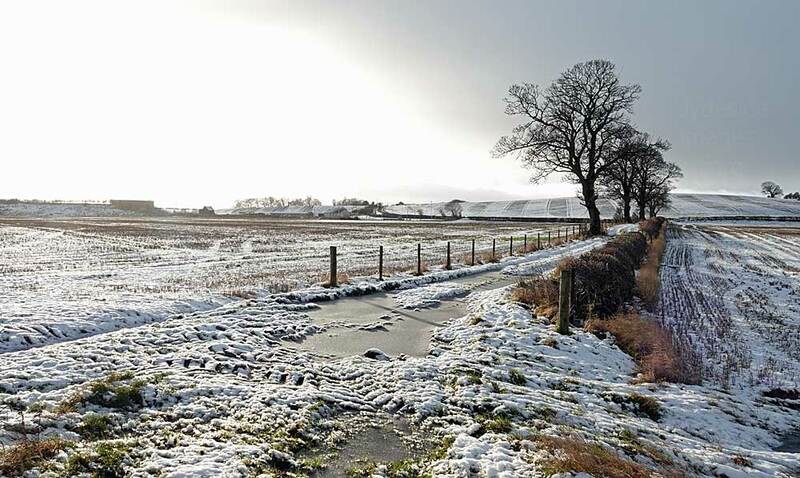 It was a different story on the roads though as on the night of 16 / 17 January, hundreds of drivers were stranded in long lines on the M74 motorway, the main route between Scotland and England after numerous jackknifed HGVs blocked the lanes. 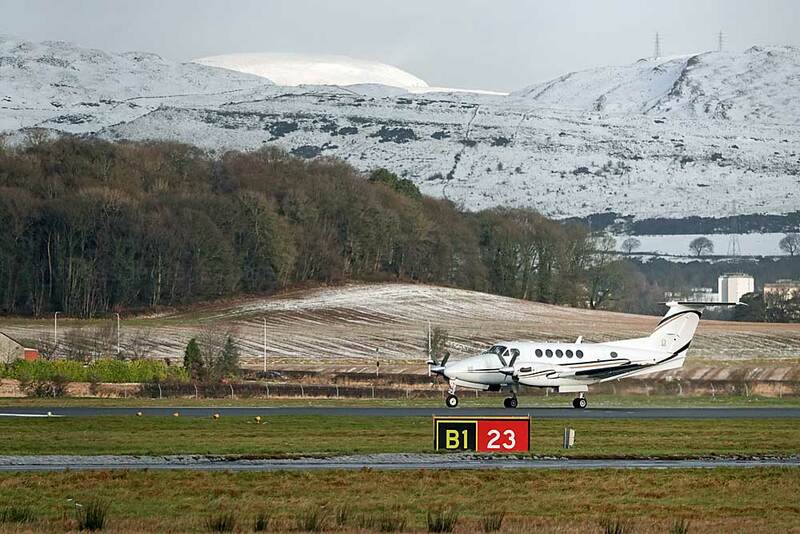 It was snowing heavily and many of the vehicle occupants were stuck in jams in South Lanarkshire and Dumfries and Galloway for up to 11 hours. On the 18th, as the weather moved east, the winds strengthened to hurricane-force before striking the mainland of northern European where eight people including two firefighters were killed in storm-related accidents. Both firefighters had been helping with clean-up efforts in Germany. 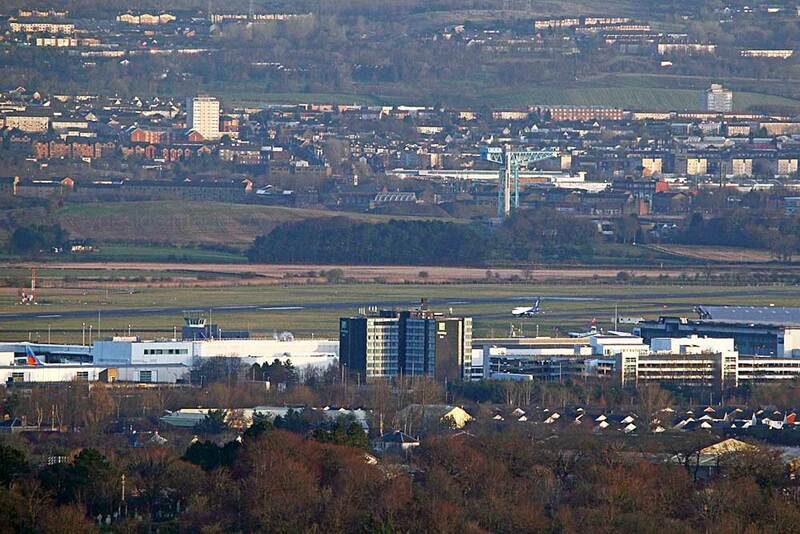 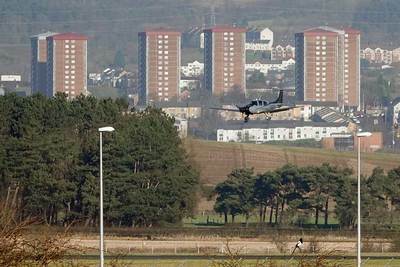 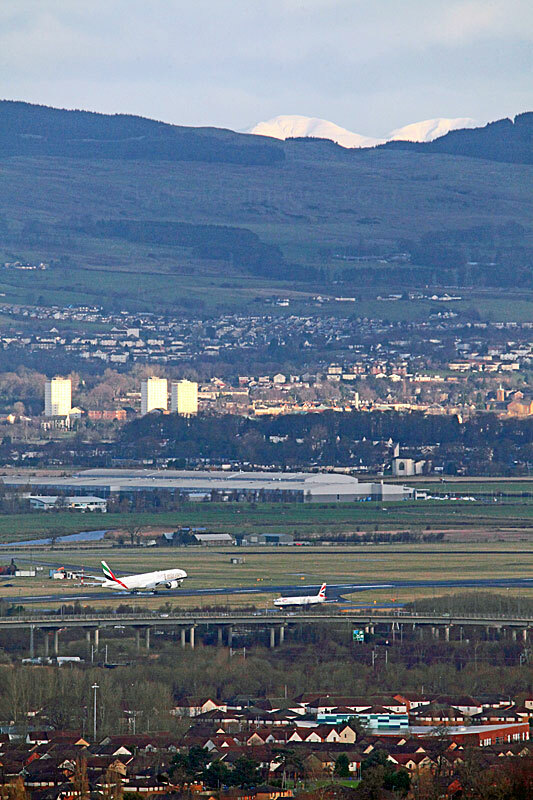 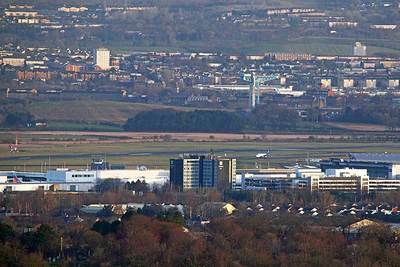 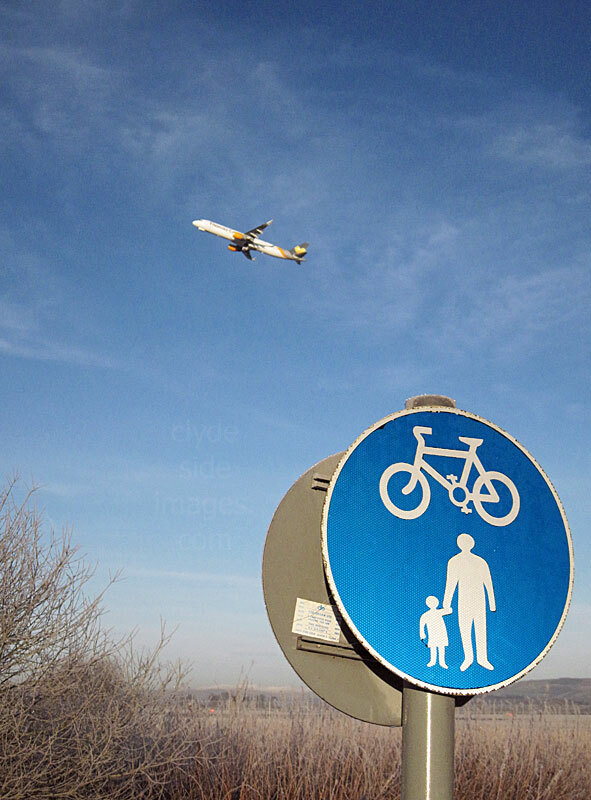 The above slideshow and following images feature views taken from the new section of cycleway including the Paisley Moss Local Nature Reserve, plus other locations around the airport perimeter such as the Black Cart Water and looking north towards Clydebank which is below the Runway 23 approach. This month I`ve included a slideshow which features some video footage for the first time, all shot hand-held with my new bridge camera therefore it`s a bit sticky and shaky in places although it may not stutter as much if viewed on an up to date, higher spec computer. 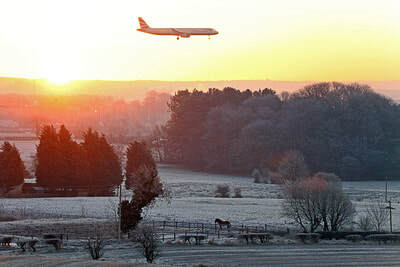 Hopefully the quality (and content) will improve as the year goes on. 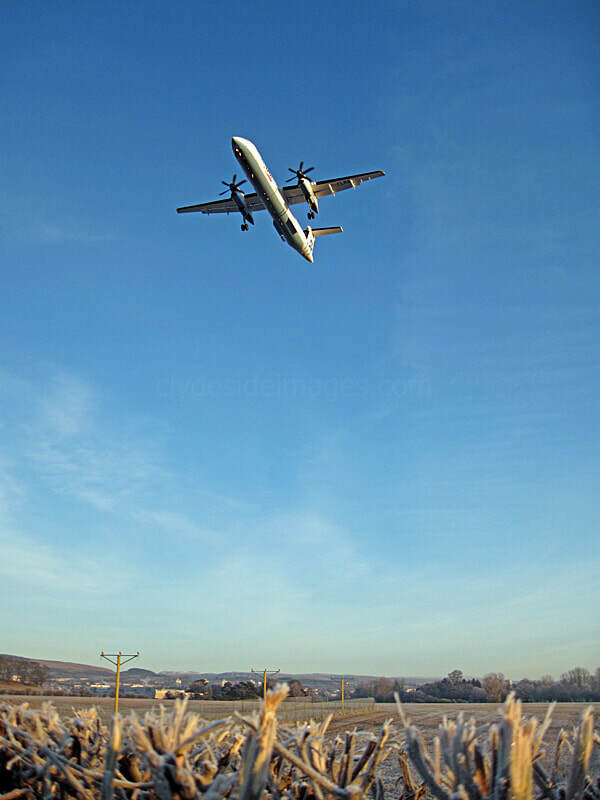 It can be surprisingly difficult to find free royalty-free music for use on personal websites but fortunately my video editing program has a few suitable tracks available. 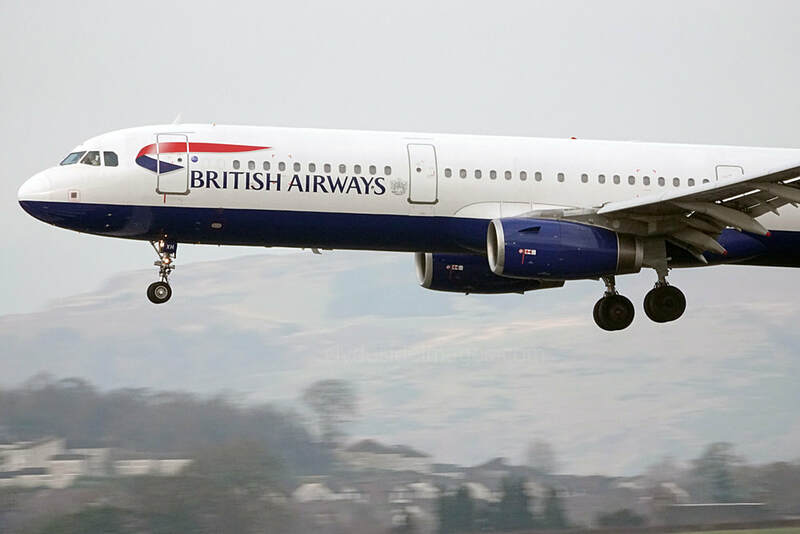 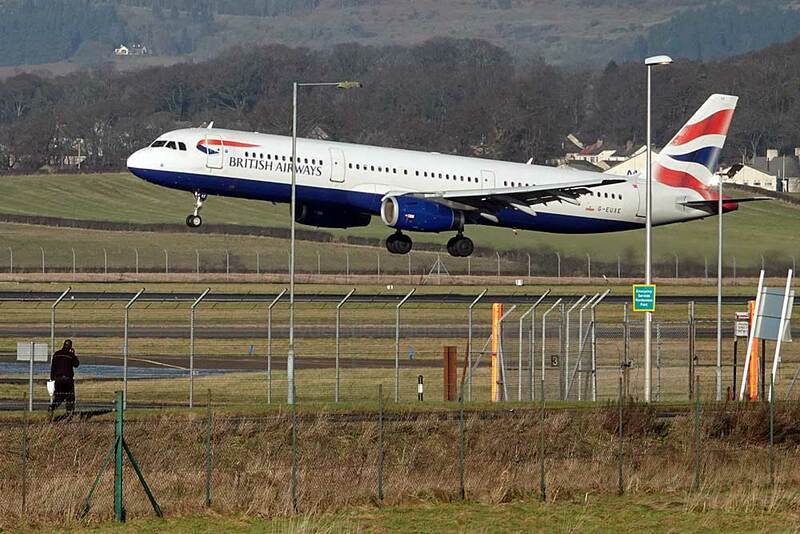 Last month British Airways filed documents with the UK Civil Aviation Authority (CAA) requesting permission to wet-lease Airbus A320s from fellow Oneworld member carrier Qatar Airways for use on unspecified routes across Europe between February 9 and April 9, inclusive. 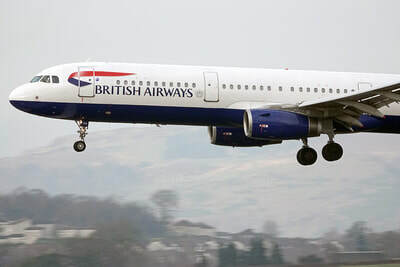 British Airways previously turned to the Qataris last year when nine A320-200s were recruited to cover a cabin crew strike. 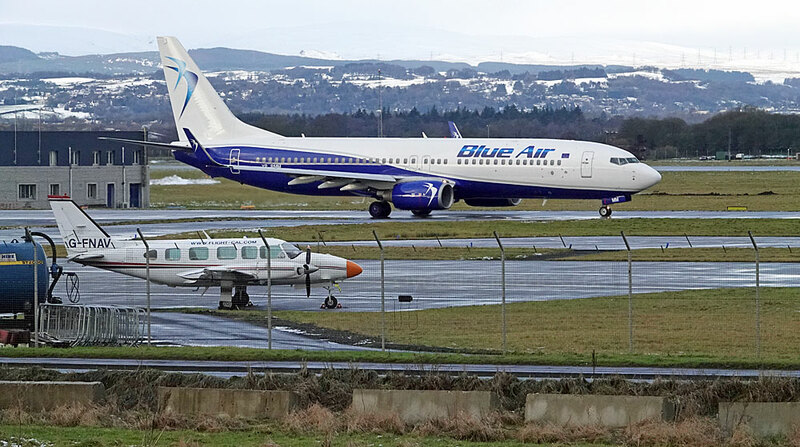 Boeing 737-82R(WL) YR-BMM Blue Air (f/v) (18th); ​CRJ-900LR D-ACKC Lufthansa (f/v) (19th); Emirates inbound Triple-seven A6-ENT finally diverted to Newcastle after doing numerous circuits due to snow on the runway (21st); A319-111 OE-LQK easyjet Europe (f/v), plus diverted Triple-seven A6-ENT flew up from Newcastle (22nd); ​Boeing 737-8K2(WL) PH-BXA KLM Retro colours (24th); ​Embraer ERJ-190SR G-LCYY British Airways (all white) (26th); Emirates Boeing Triple-seven A6-EPO in Expo 2020 colours made its second visit this month (27th); Boeing 757-256(WL) TF-FIU Icelandair (Aurora Borealis colours), A319-132 D-AGWG Germanwings (f/v) and Bombardier CRJ-900LR D-ACKL Lufthansa (f/v) (28th); ​A319-111 OE-LQW easyJet Europe (f/v) (30th); Boeing 737-8 MAX A4O-MA Oman Air (f/v) on delivery (31st). 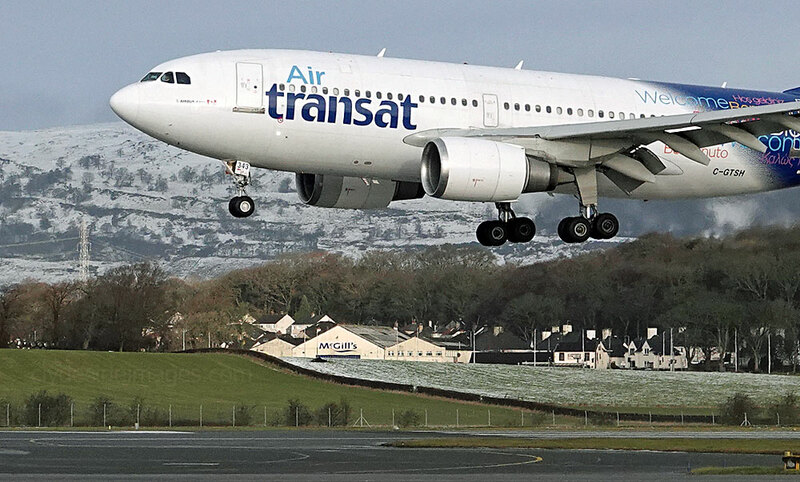 On 13 November 2017, Air Transat unveiled its new fleet livery to celebrate 30 years of operations. 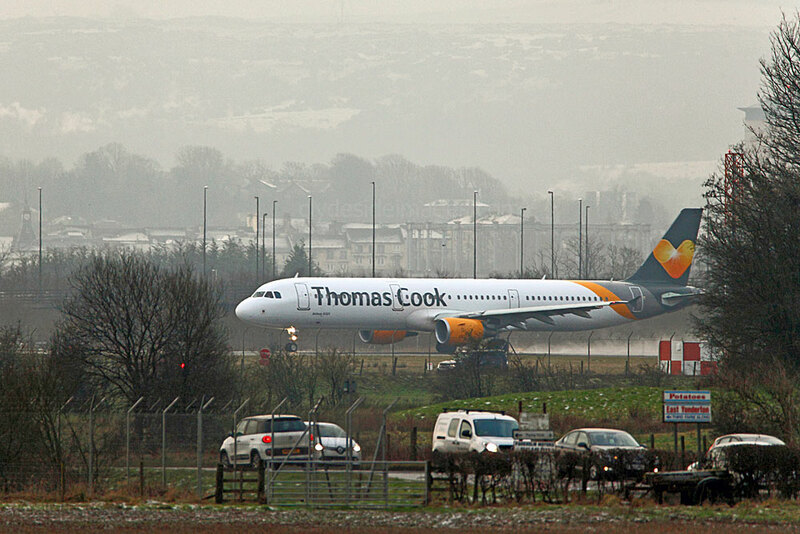 The first aircraft to receive a make-over was Airbus A330-243 C-GTSN​​ which visited Glasgow sporting its new colour scheme for the first time on a murky 4th January 2018, and personally I think the latest livery is a big improvement. 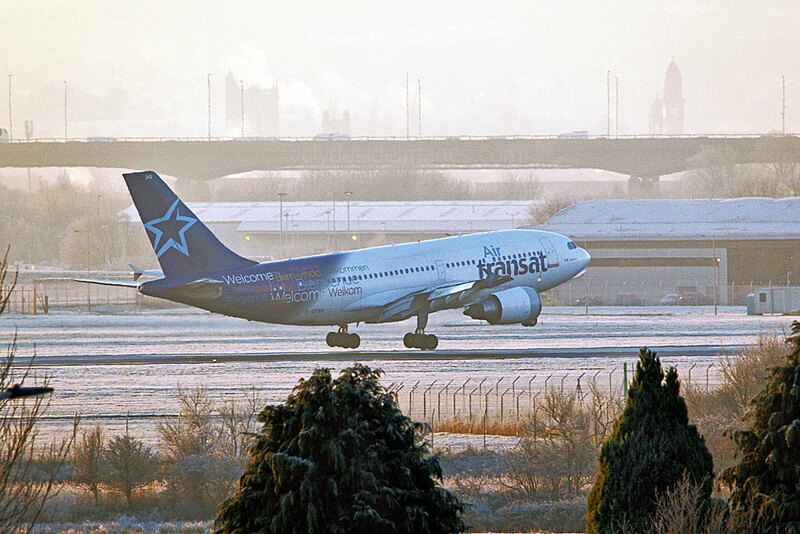 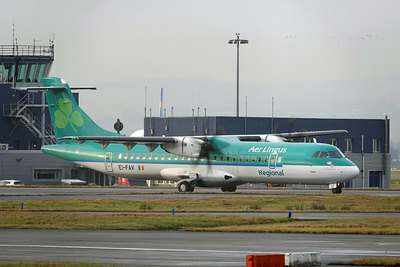 The airline`s star icon on the tail now features more prominently and is set against a blue gradient that symbolises the sky and oceans crossed taking passengers to numerous destinations across the globe. 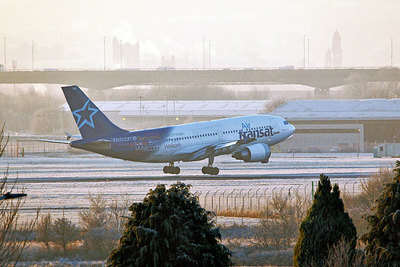 The silver band between the tail and white part of the body is a subtle nod to the metallic fuselage of the airline`s first plane while the two-tone Air Transat logo at the front uses smaller text than before to appear on one line with a bold copy on the belly, enabling people to more easily identify the brand when the planes overfly. 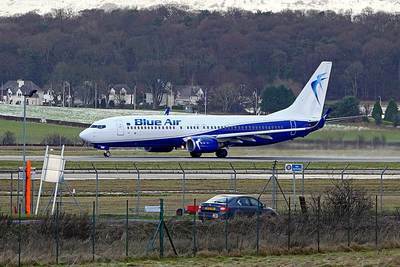 Blue Air`s Boeing 737-82R(WL) YR-BMM was a welcome first-time visitor on Thursday 18 January. At a press conference in Paris this month, Irish low-cost carrier Ryanair announced that it was currently in talks with French regional airports with a view to opening up as many as four bases in the latter country by 2020. 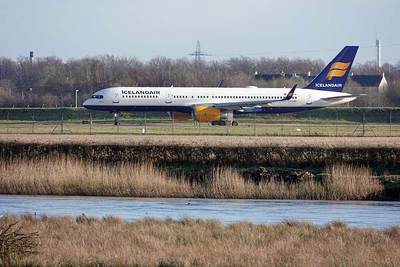 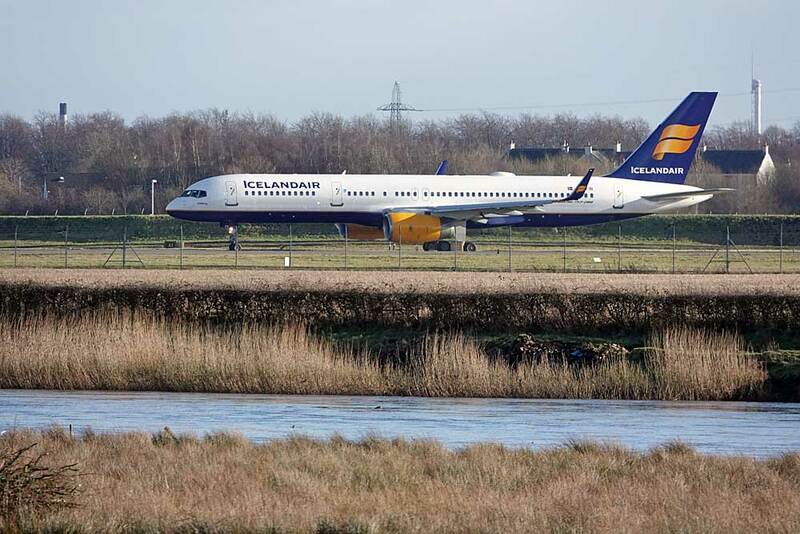 While the airline has not decided on the bases, Marseilles, Paris Beauvais, Lyon St. Exupéry, Toulouse Blagnac and Nantes are listed as potential locations. 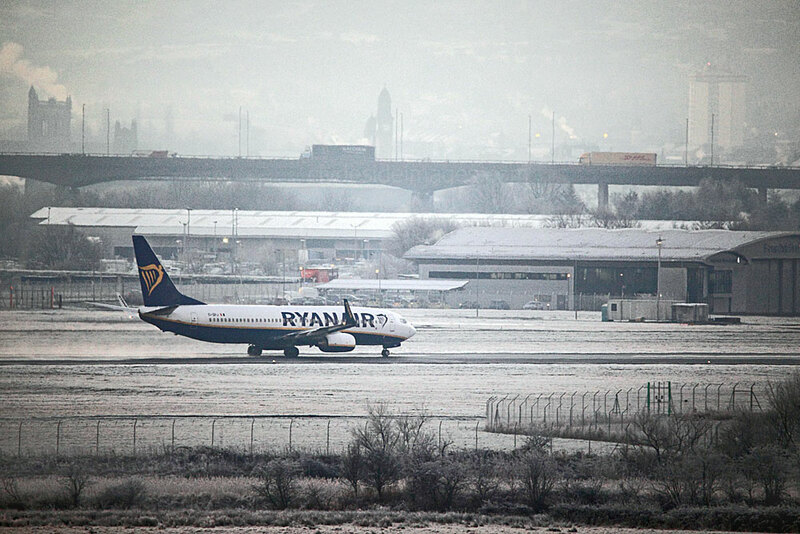 Ryanair intends to have up to thirty B737-800s working out of France in the initial phase with the first base operational by winter 2018/2019. Ryanair is also talking to the French pilot union SNPL and will offer jobs at its French bases under the local labour law. 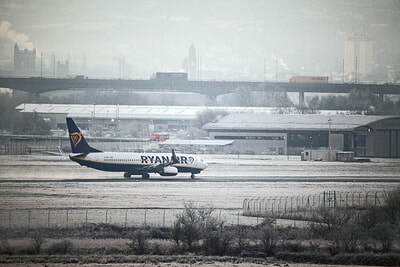 Ryanair does not base any aircraft in France at present but currently serves 27 French airports, with the largest by capacity being Paris Beauvais, then Marseille, Toulouse Blagnac, and Bordeaux. 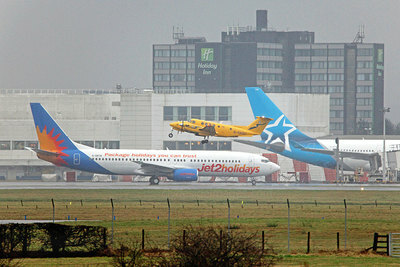 During the same press conference, Ryanair announced the addition of ten new routes out of four French airports, its largest one-time expansion in the country for some time. 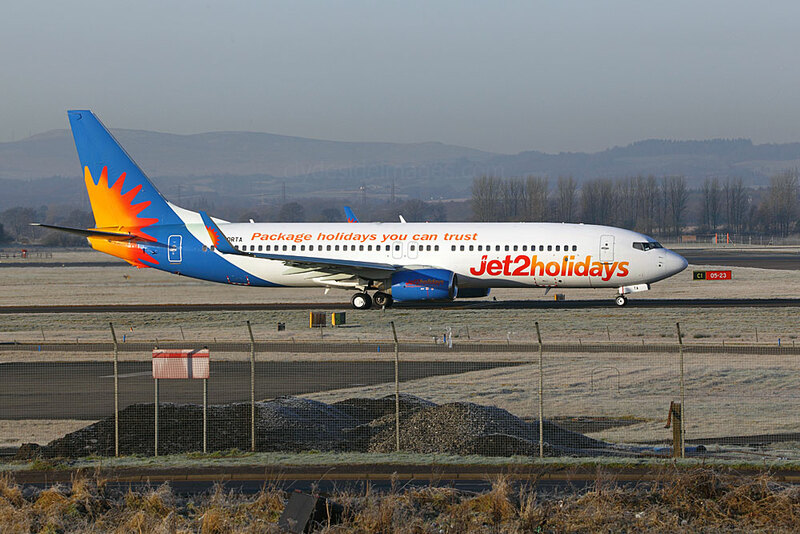 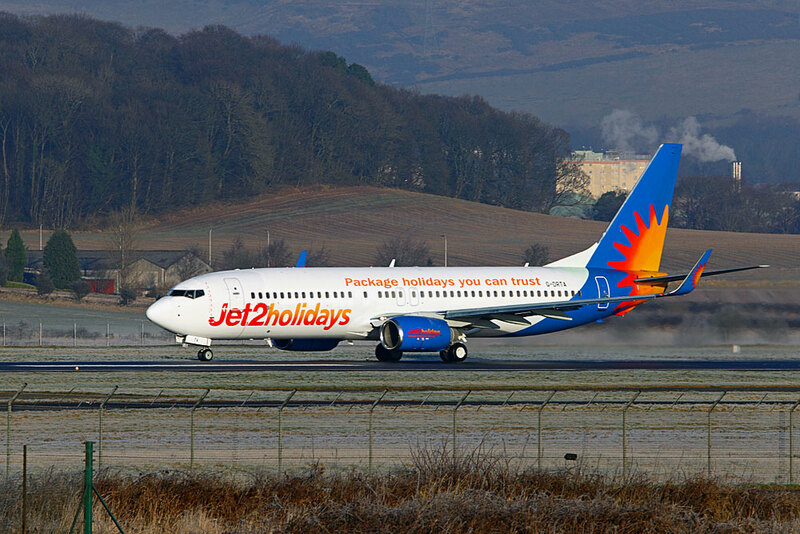 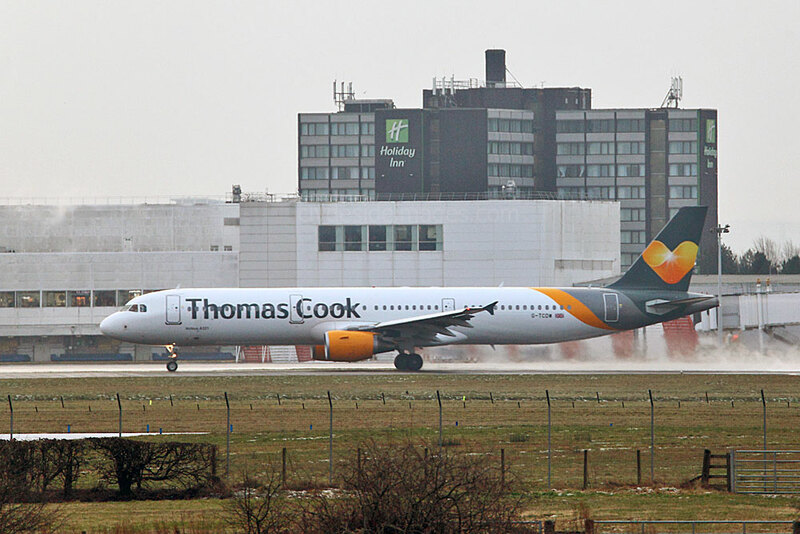 The move follows a recent change in the low-cost carrier's employment policy as it recognised trade unions at the end of 2017, following a pilot shortage in autumn. 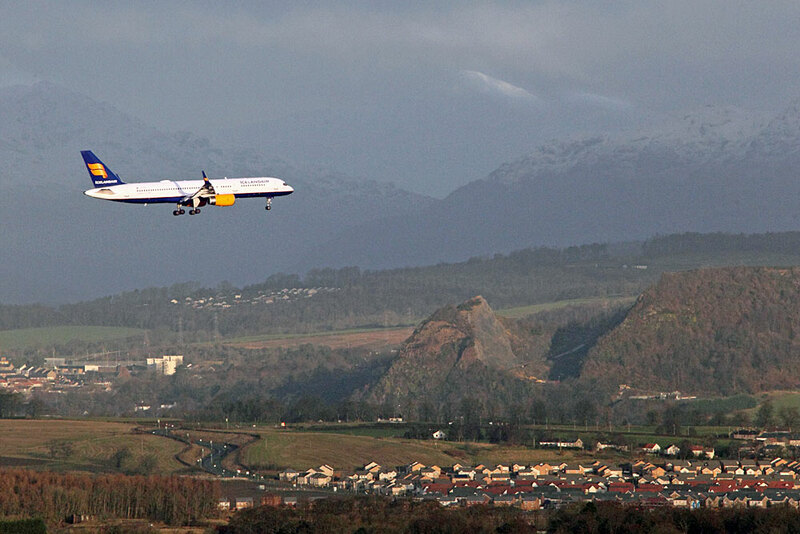 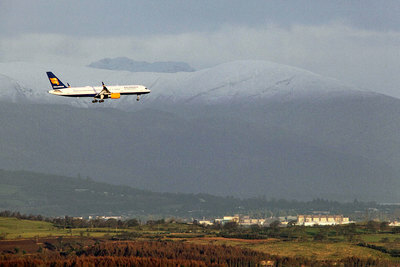 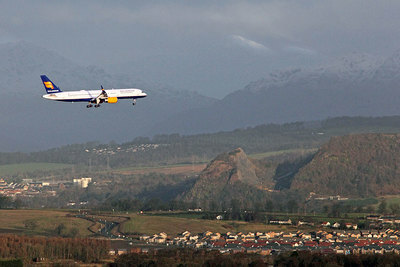 Boeing 737-8AS(WL) EI-DWC with `Costa Brava - Girona` titles is pictured below landing on Monday 29 January. 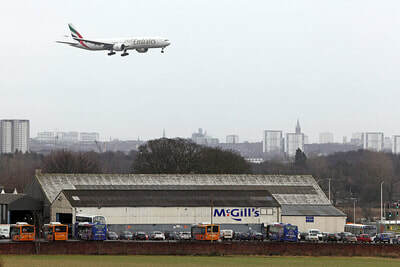 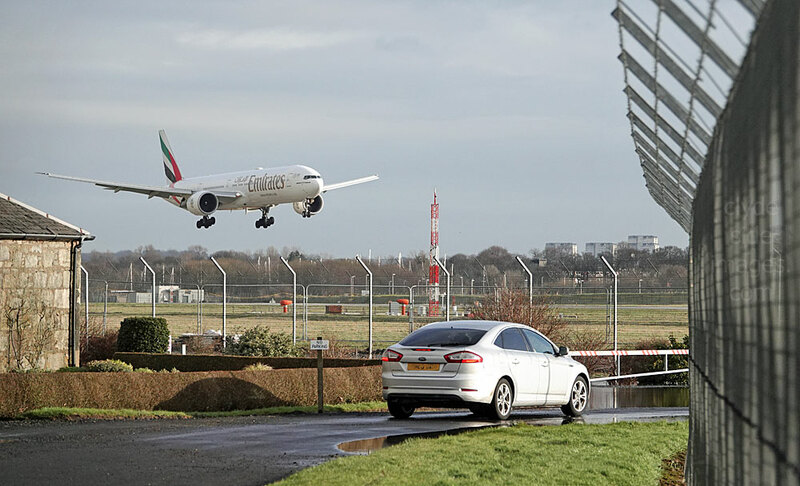 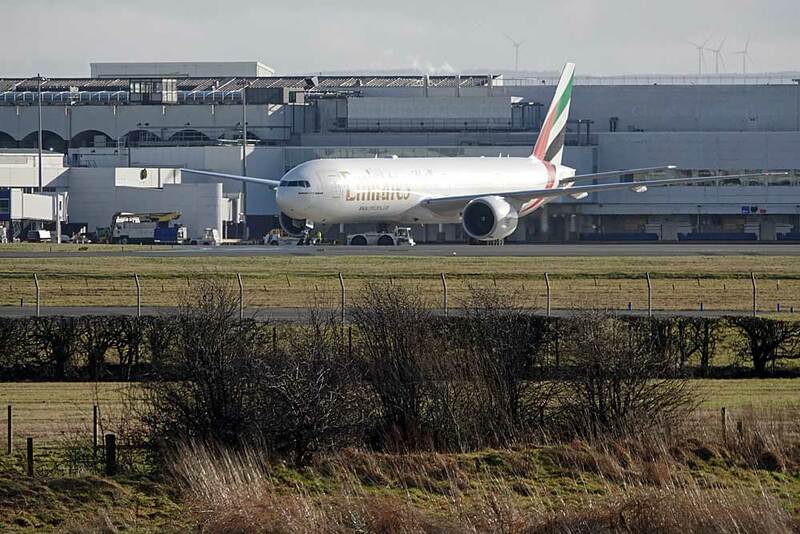 No less than three Emirates Boeing 777s visited on Saturday 6 January, with A6-EBT brought in on an extra morning flight due to high passenger demand. 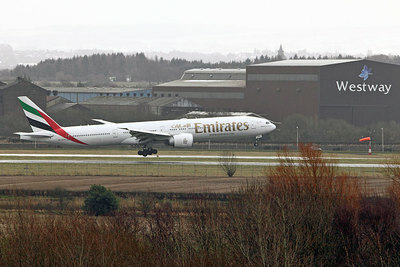 It landed at 10:05 hrs with A6-ENC and A6-ENK arriving as scheduled later. 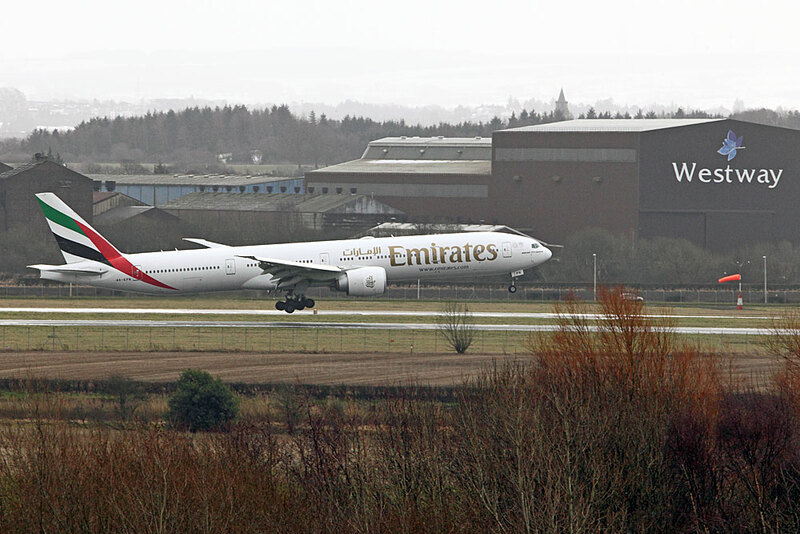 As the departure and arrival times of the first and second aircraft overlapped, I believe this was the first time that two scheduled Emirates Triple-sevens were on the ground here together. 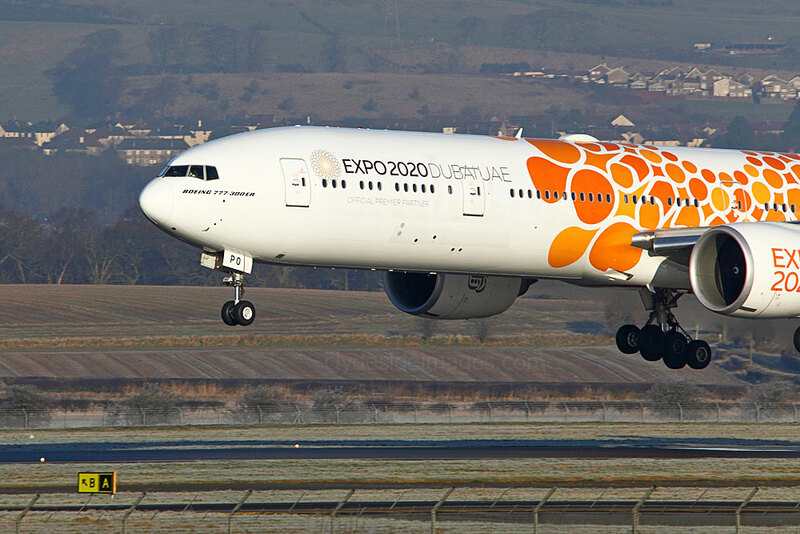 ​Boeing 777-31H(ER) A6-EPO in Expo 2020 colours appeared on Sunday 7th January. 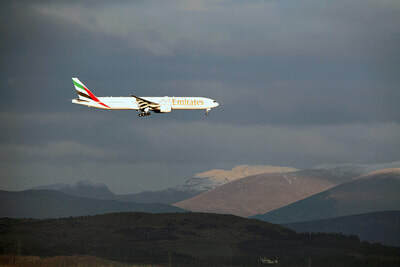 This is one of 40 Emirates` airliners currently carrying three distinct designs to publicise Expo 2020 which is due to held in Dubai in October of that year. 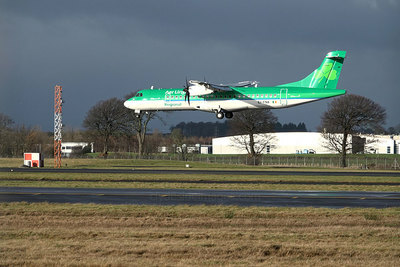 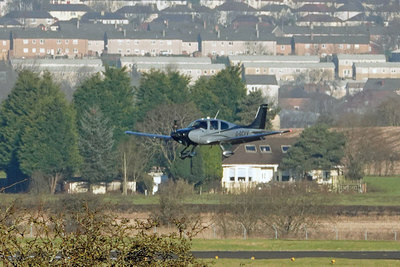 Another Triple-seven, A6-EPU sporting a green variation on the scheme, visited Glasgow on 1 December last year. 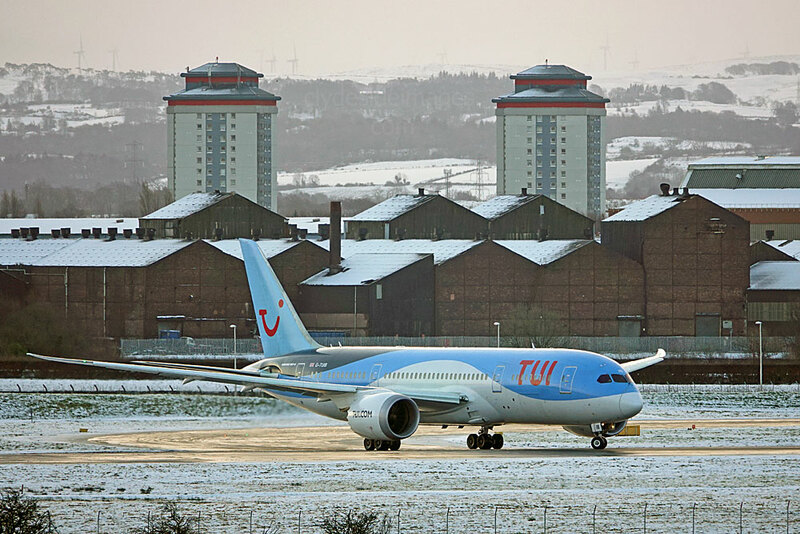 Triple-seven A6-EBB moments from touchdown on Runway 23. 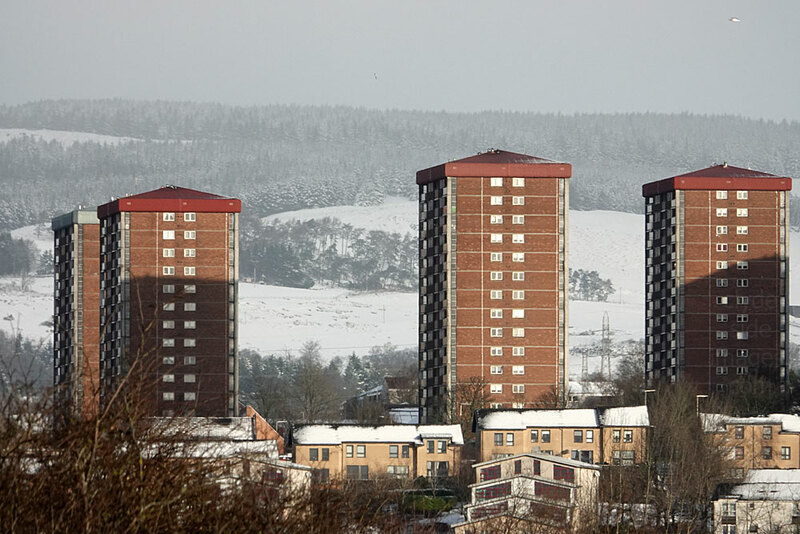 Tuesday 30.01.2018. 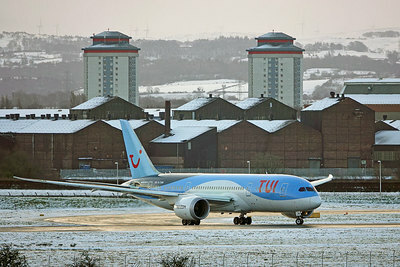 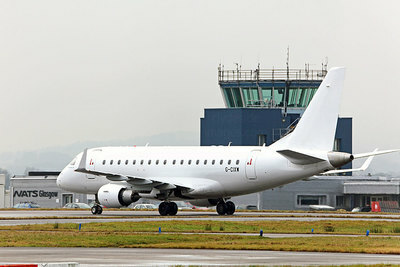 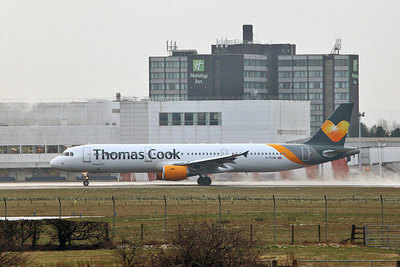 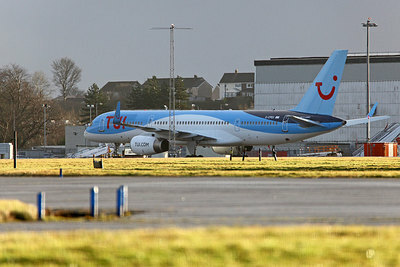 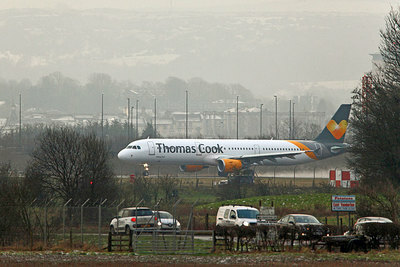 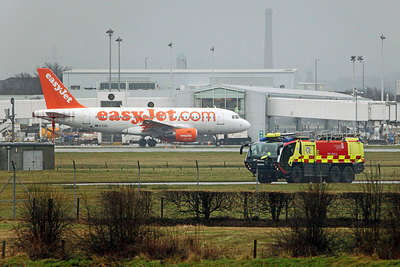 This month`s highlight airliner-wise was a surprise arrival which didn`t appear until the last few hours of January. 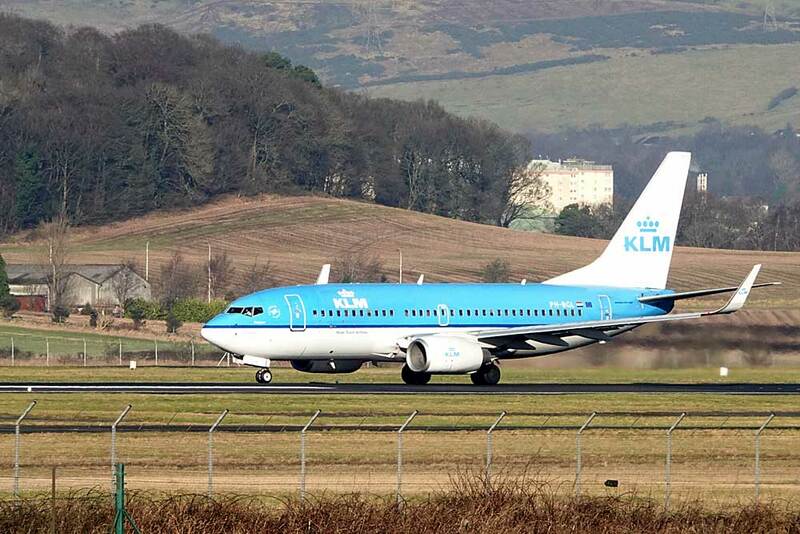 A40-MA (f/v) is the first of 30 Boeing 737 MAX 8's for Oman Air and was on delivery from Boeing Field. 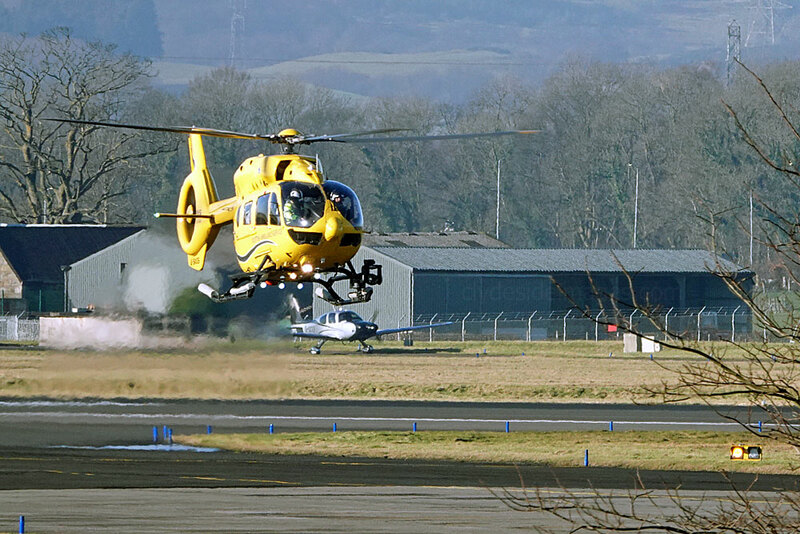 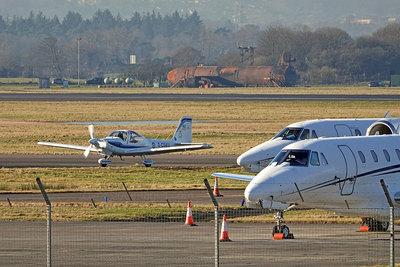 The next generation aircraft is pictured here the next day on Stand 81 preparing to depart on the last leg of its journey. Let`s hope the rest of these new additions will route through Glasgow. 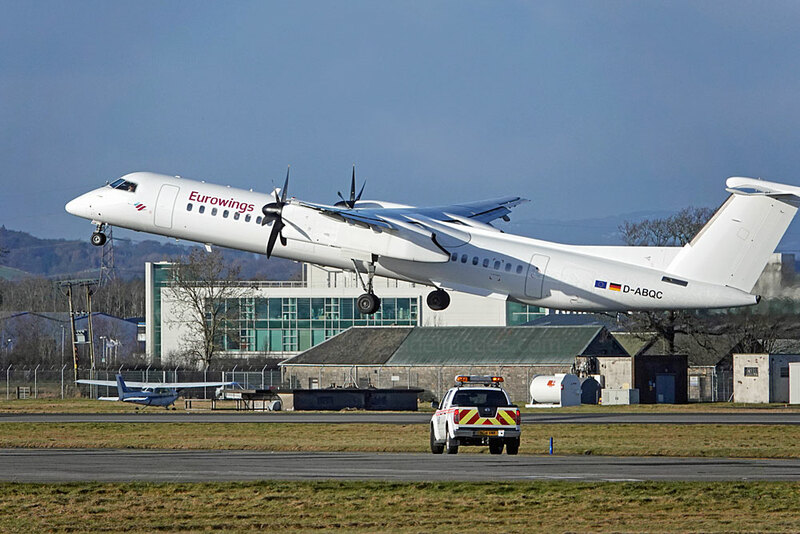 Not much doing this month on the turboprop front with Dash 8s of Eurowings, some of which were still in Air Berlin colours, providing the only interest. 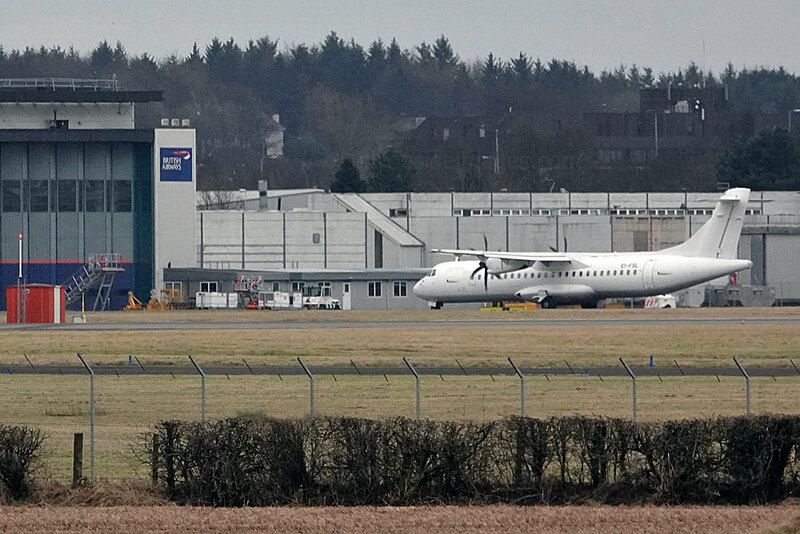 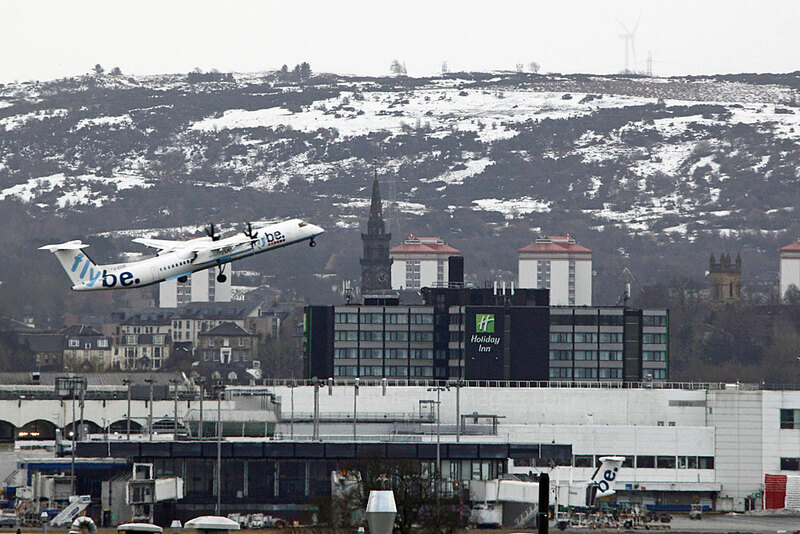 All-white Eurowings Dash 8 D-ABQG worked the Glasgow - Dusseldorf route on Monday 15 January with D-ABQC (below) on the 29th. 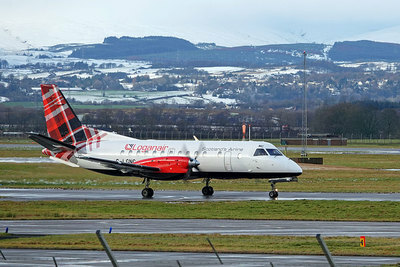 Loganair, which had seen pre-tax profits fall by 11%, to £3 million by 31 March 2017, announced that rebranding and start-up costs for new contracts had contributed to an expected loss over the current financial year. 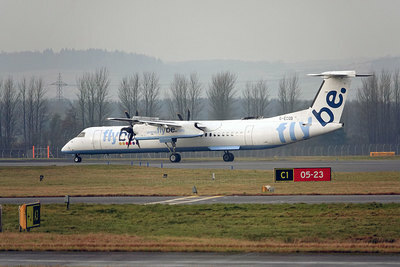 The Scottish airline went independent last September after ending its long-running franchise agreement with Flybe and although the financial forecast looks relatively bright, Loganair said that there had been considerable outlay to support "own-brand activity" including a new reservations system and bookings website, a customer contact centre at its Glasgow Airport HQ, and a `tartan make-over` for its aircraft fleet. 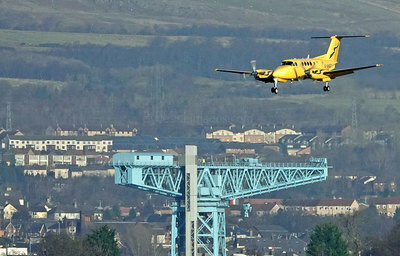 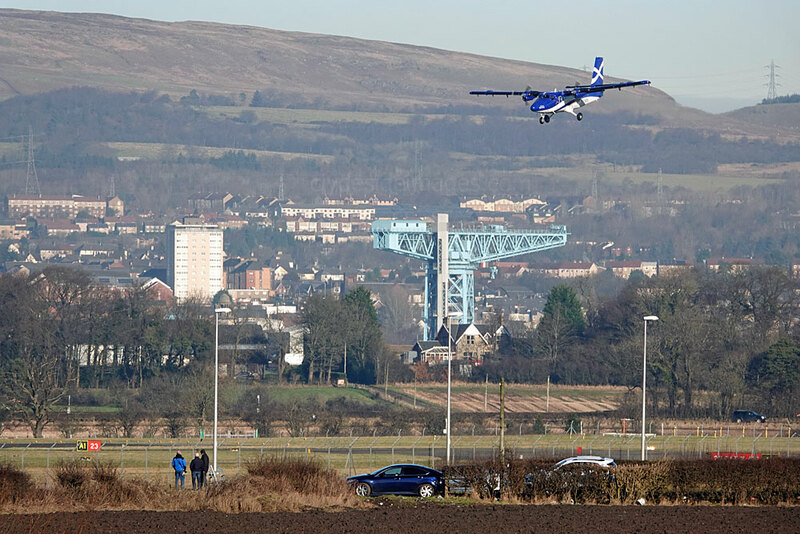 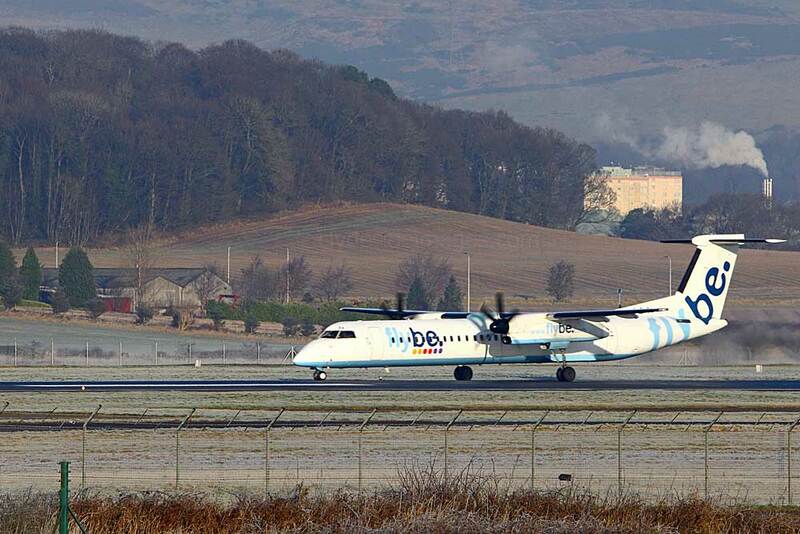 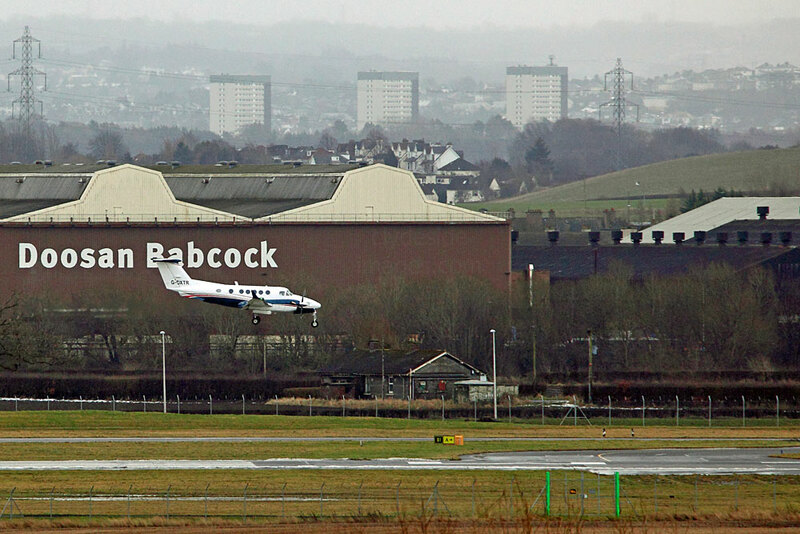 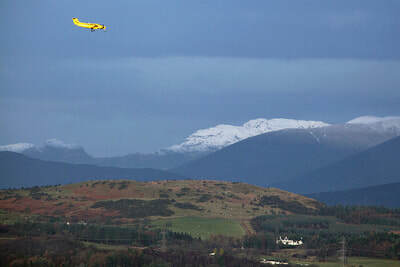 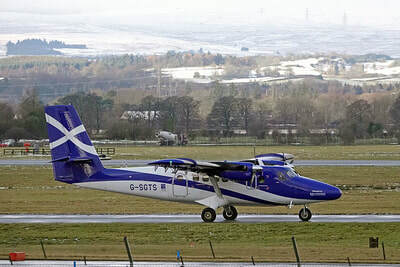 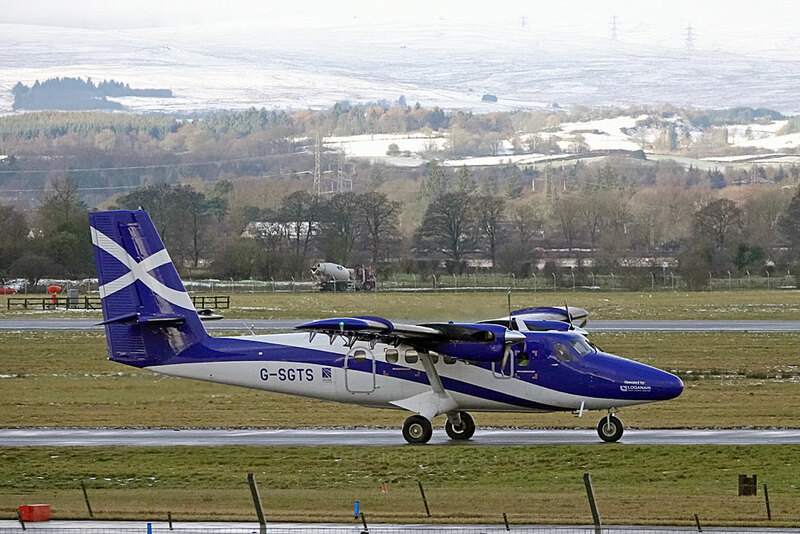 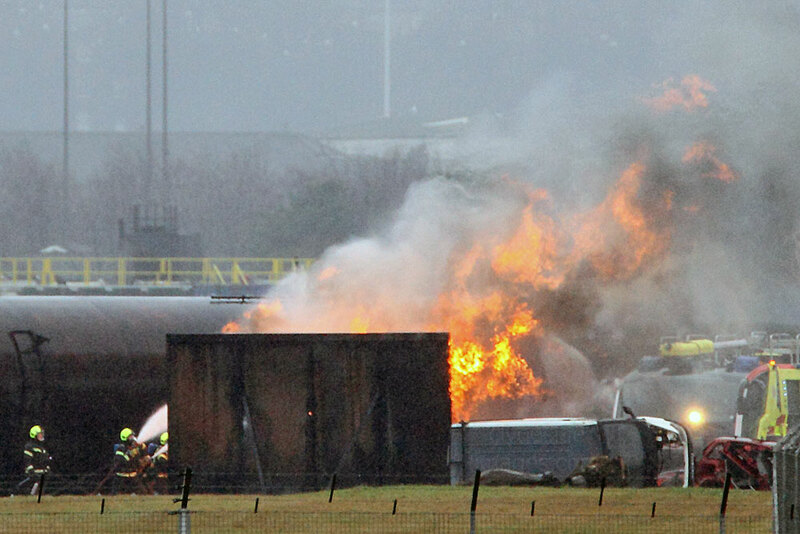 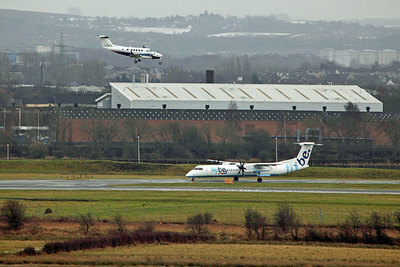 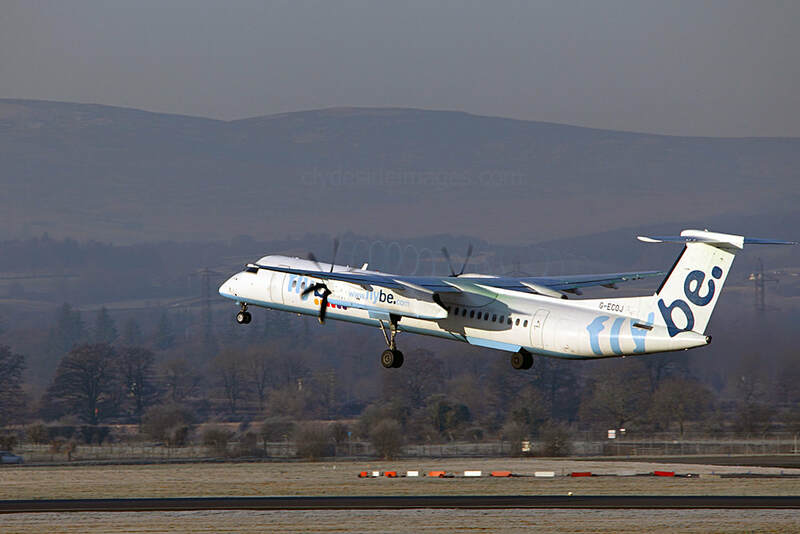 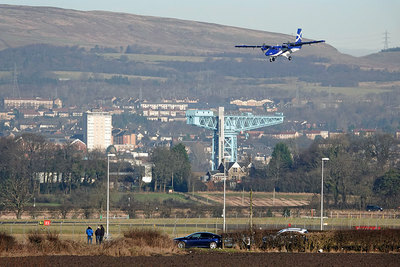 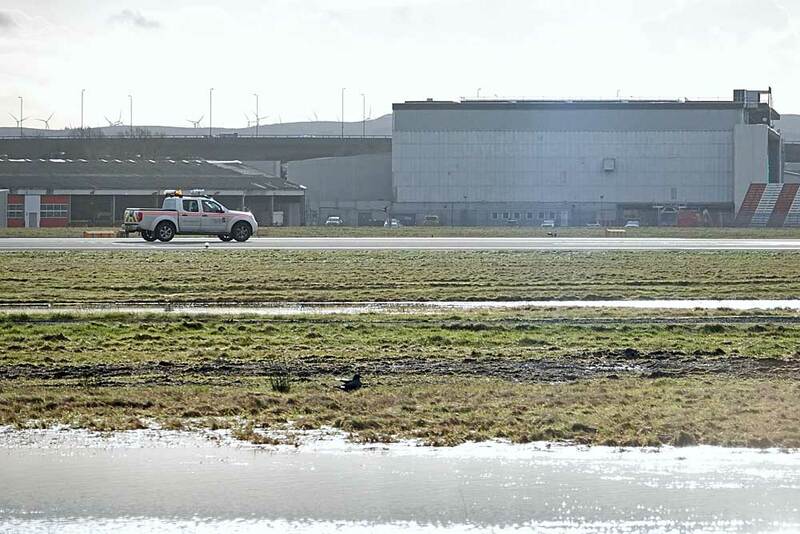 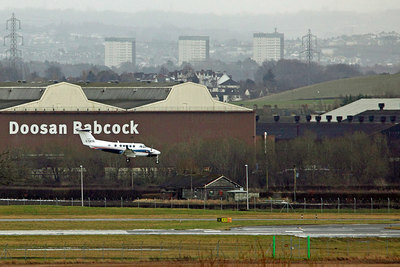 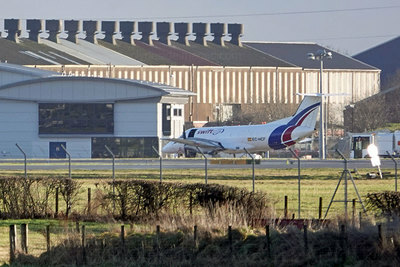 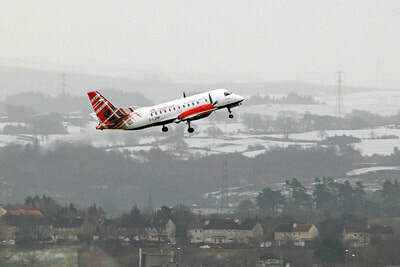 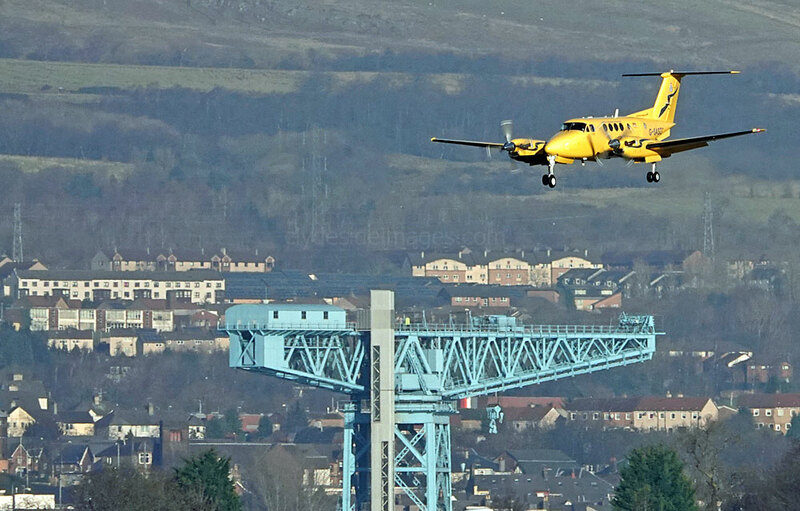 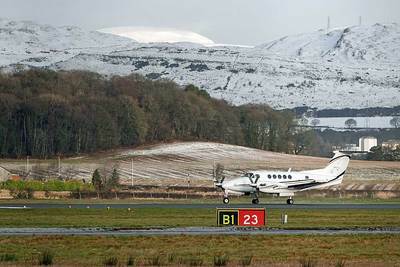 ​Latest to reappear at Glasgow sporting a shiny new paint job was Twin Otter workhorse G-BVVK, seen here on 29 January. 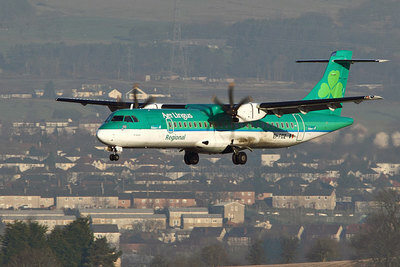 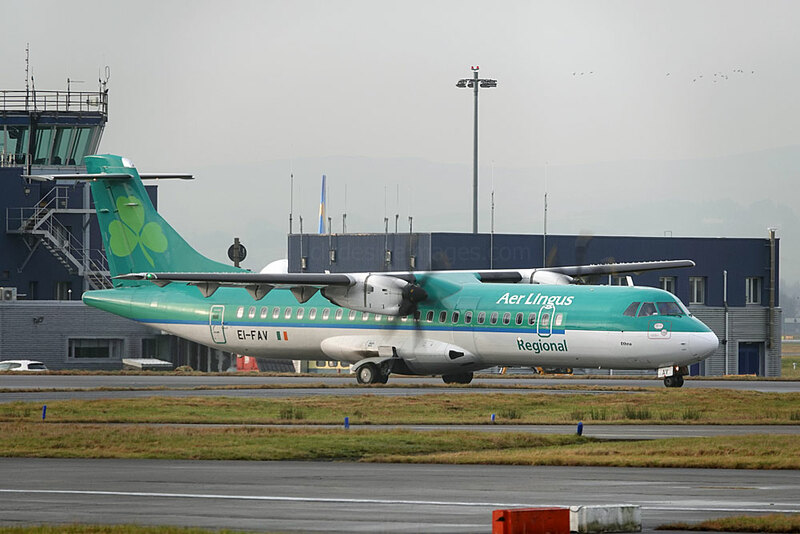 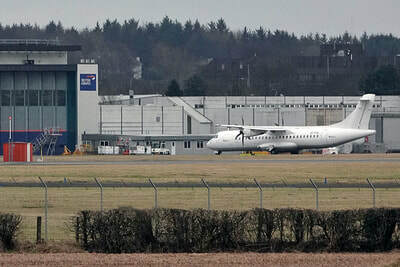 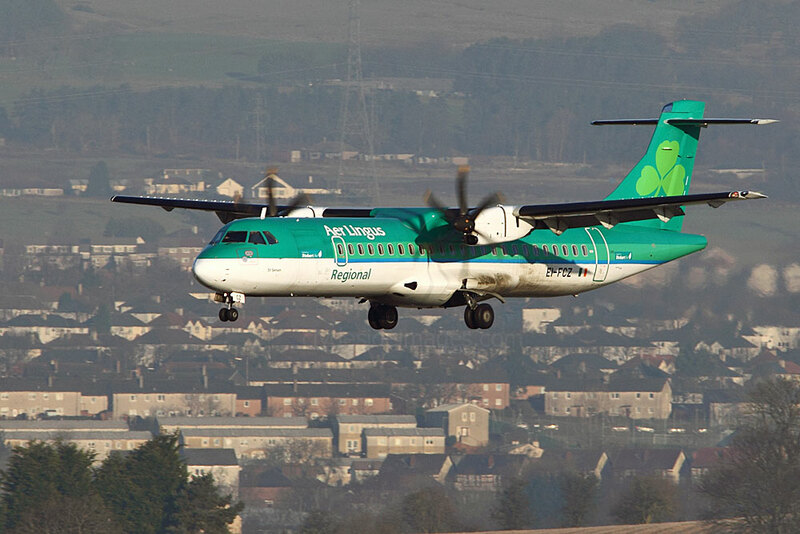 The airline has named this aircraft `Spirit of Eilidh` as a tribute to Barra teenager Eilidh Macleod (14) who lost her life in last year`s terrorist attack at Manchester Arena which killed 22 people on 22 May. 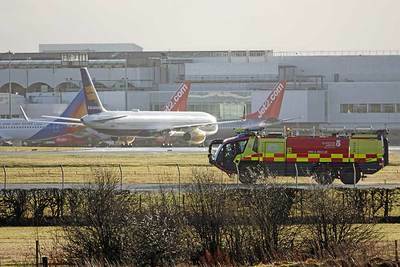 ​Eilidh and her friend Laura MacIntyre, aged 15, who was seriously injured in the incident, had travelled to the city to attend a pop concert by American singer Ariana Grande. 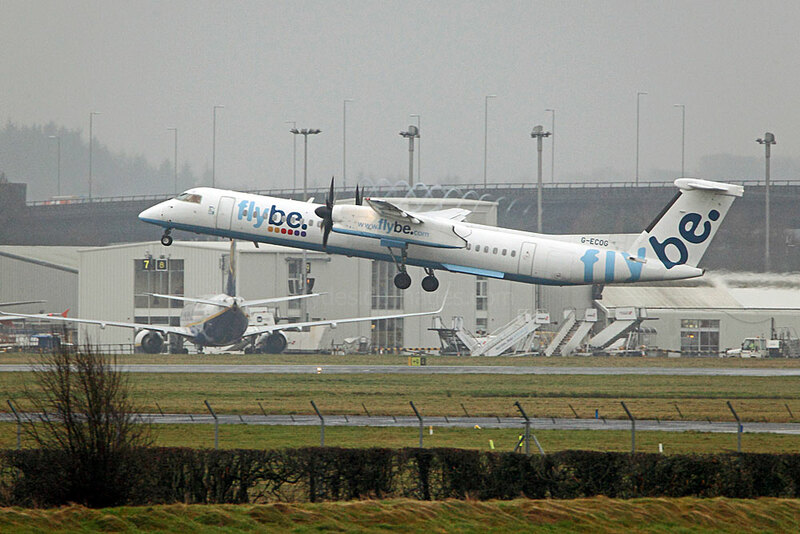 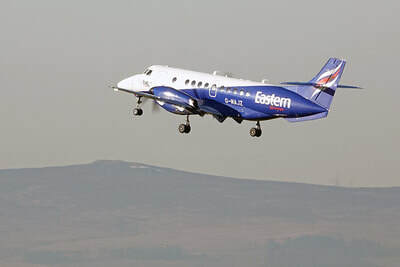 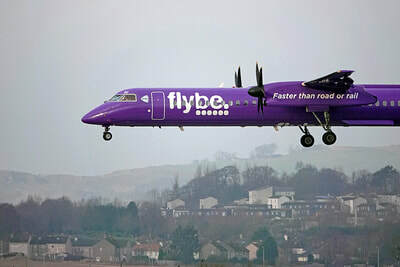 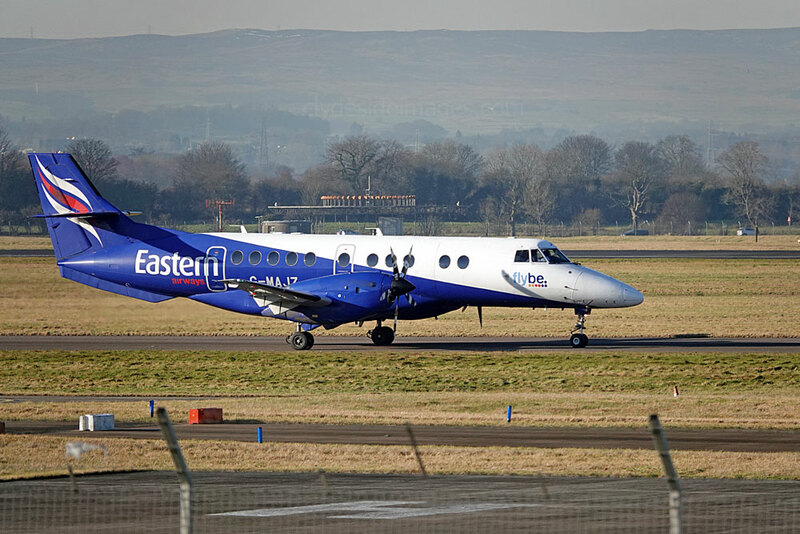 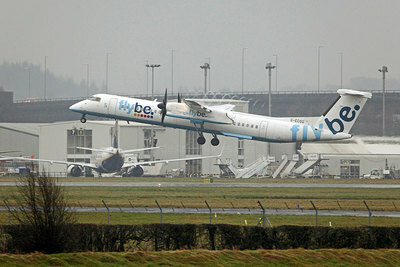 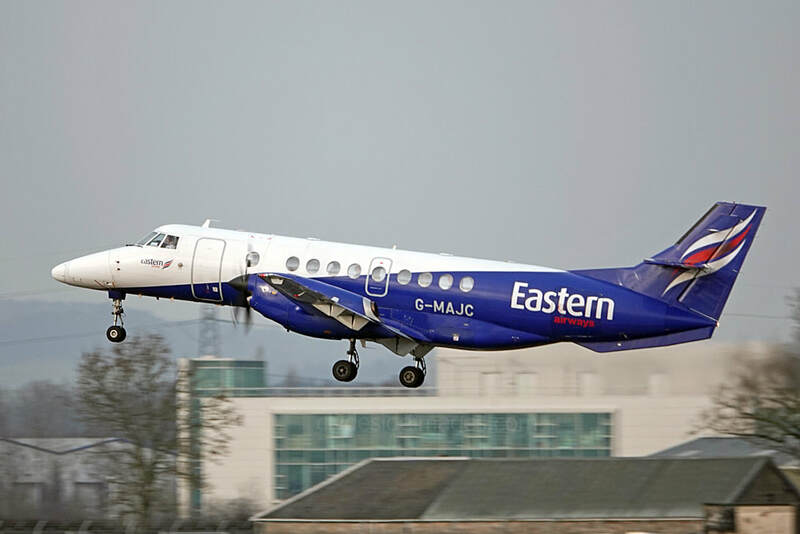 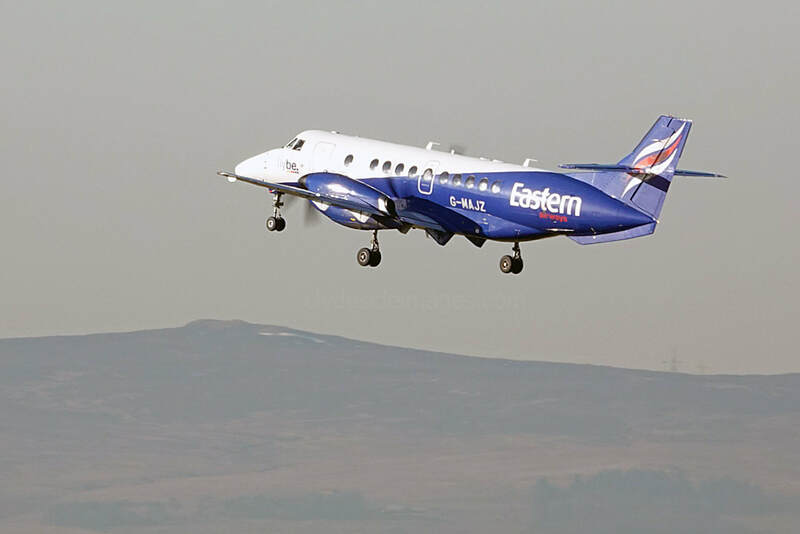 ​Competition on some Scottish island routes from Loganair`s erstwhile partner didn`t help either company and Flybe, now linked with Eastern Airways, withdrew from the battle for customers earlier this month which didn`t come as a surprise to many industry experts and passengers who regularly utilise the services in question. 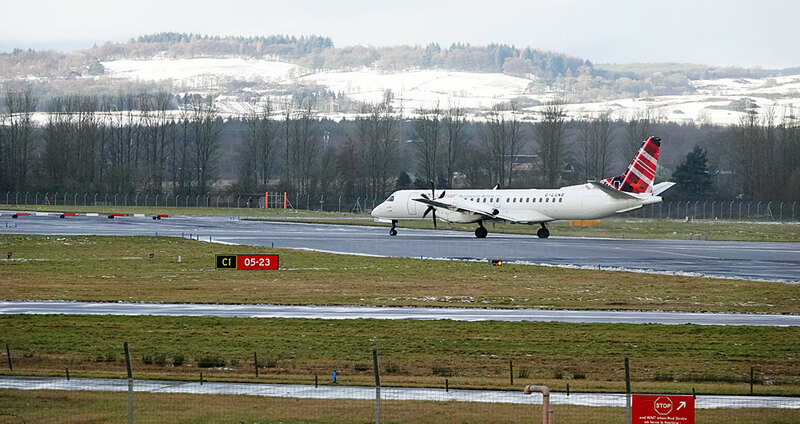 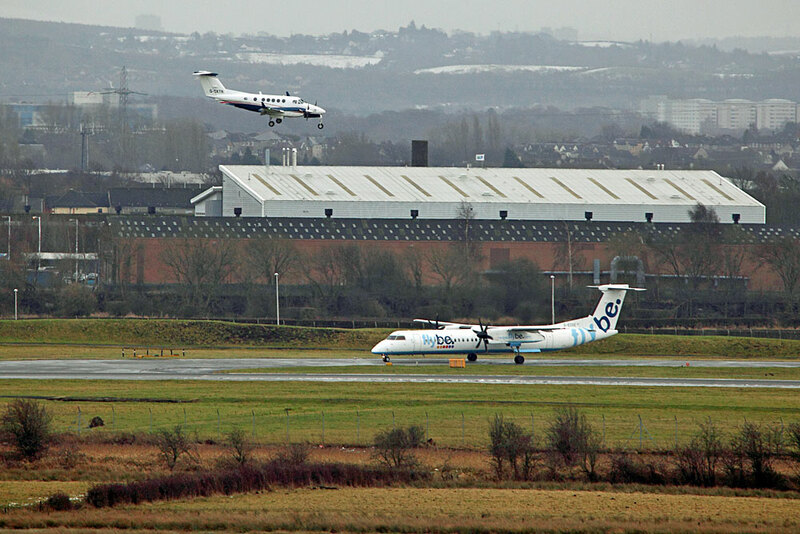 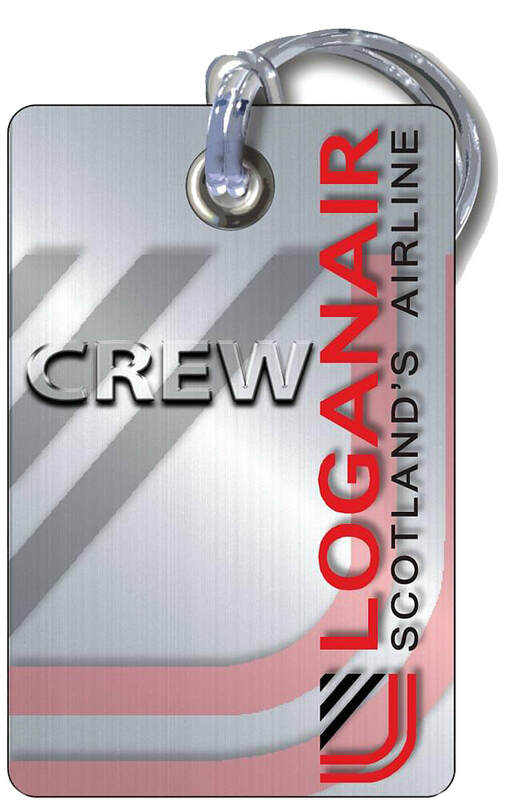 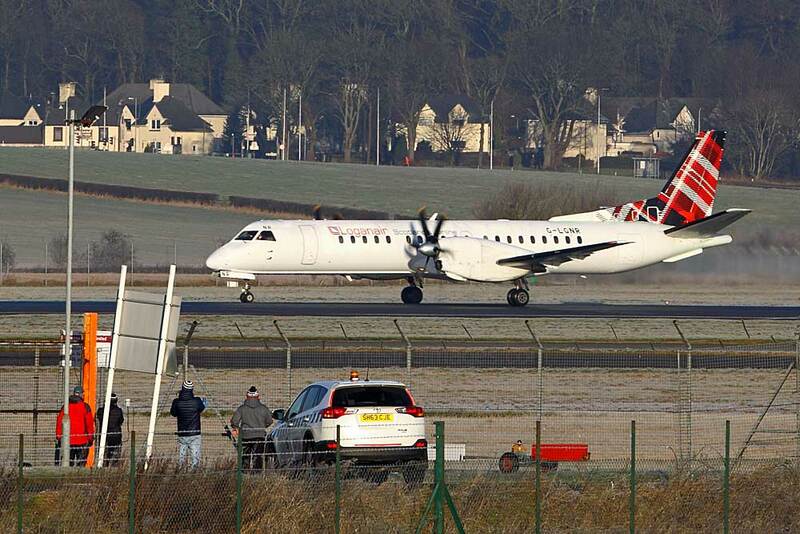 Loganair now serves more than 40 routes across the UK, the Republic of Ireland and Norway, and secured long-term charter contracts with major oil and gas operators using Loganair's hub at Sumburgh, while gaining a "new and enlarged" five-year contract with Royal Mail. 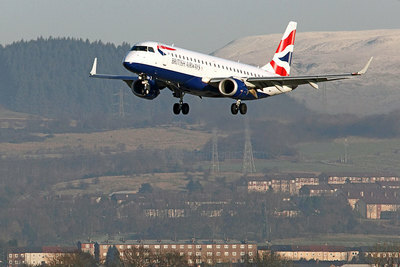 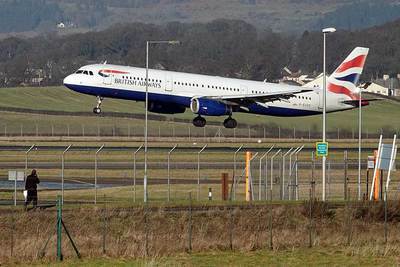 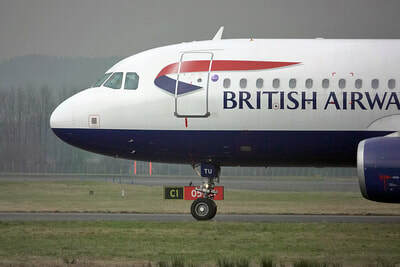 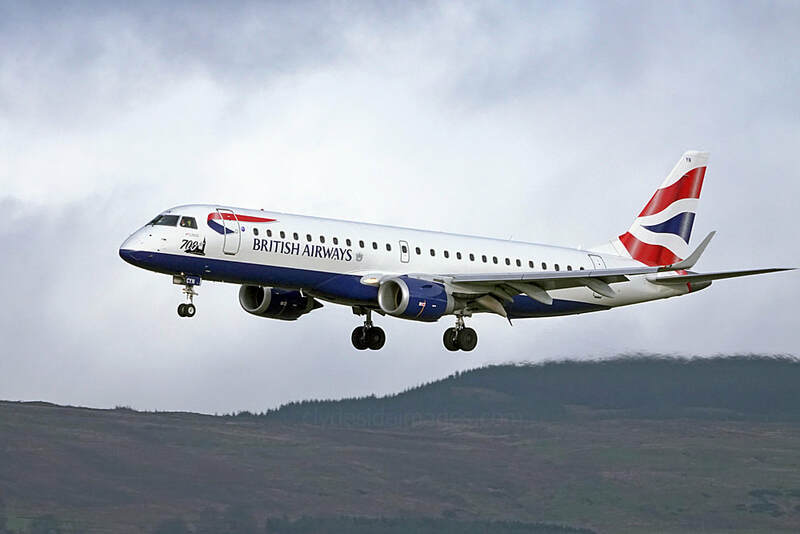 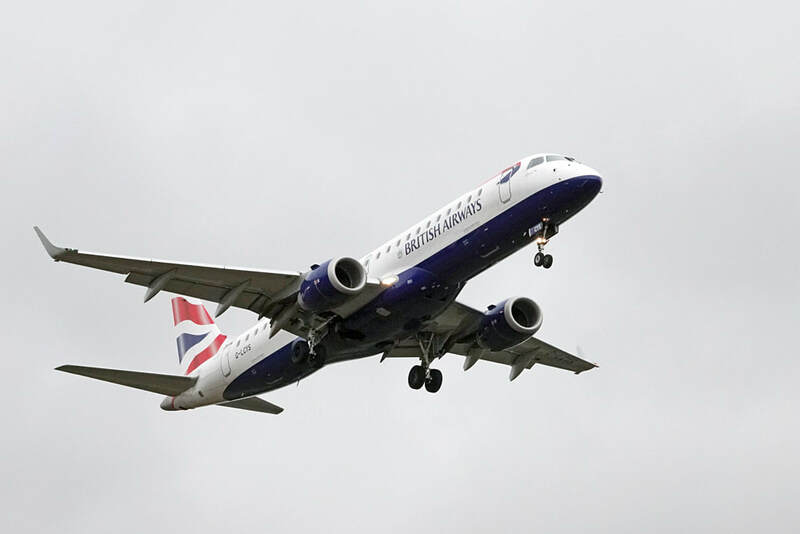 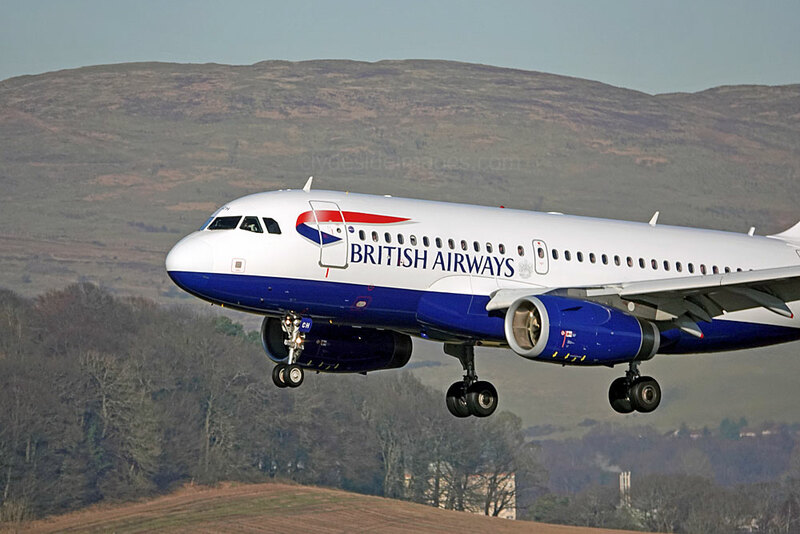 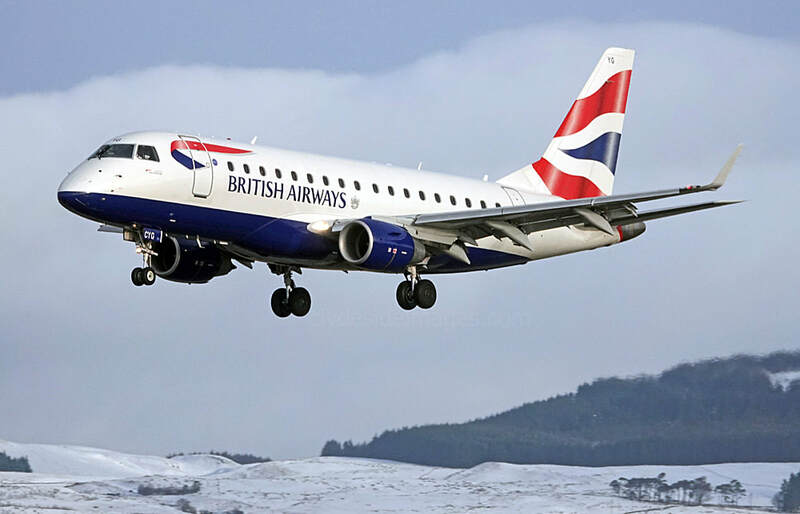 ​A code-share agreement with British Airways, connects Loganair passengers to short and long-haul flights, and an arrangement with easyJet enables the regional airline`s flights to be marketed on the low-cost carrier`s website. 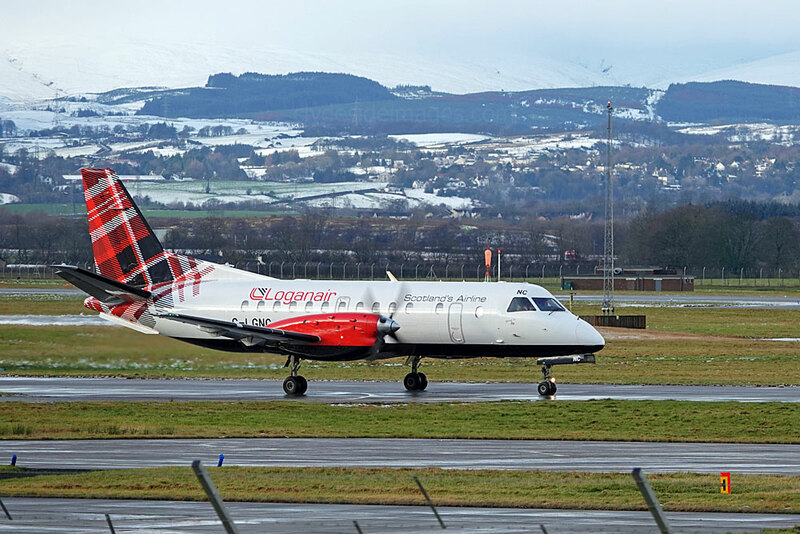 Loganair`s latest route news is that it will reintroduce services between Glasgow and Donegal on 25 March 2018, replacing Stobart Air`s ATRs which currently provide the service. 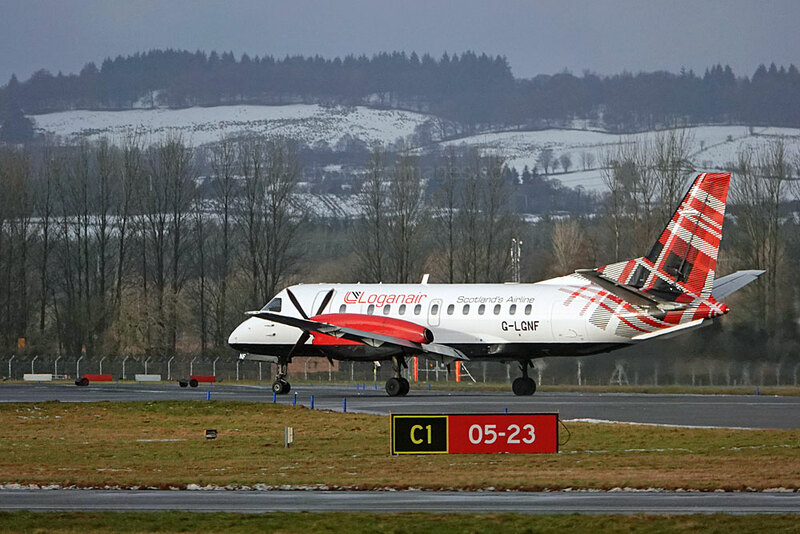 There will be three return flights per week, year round on Tuesdays, Thursdays and Sundays with extra flights on Wednesdays and Saturdays during the summer. 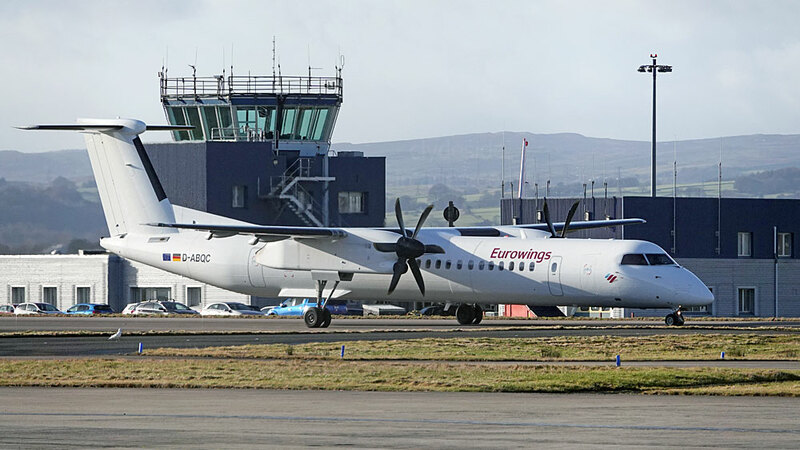 ​The only visiting turboprops worth mentioning this month were ATR 72-600 EI-FMJ Aer Lingus (Flybe colours) (4th); ​Bombardier DHC-8-Q-402 D-ABQG Eurowings (f/v) and Dornier 328-110 G-BYHG Loganair (5th); ​Bombardier DHC-8-Q-402 D-ABQA Eurowings (f/v) (16th); ​DHC8-402 D-ABQE Eurowings (f/v) (19th); ​DHC8-402 D-ABQL Air Berlin colours (f/v) (20th); ATR72-202F EI-SLU ASL Airlines (f/v) (26th); ​BN-2B-26 Islander G-HEBO Hebridean (30th); Bombardier DHC-8-Q-402 D-ABQJ Eurowings (f/v) (31st). 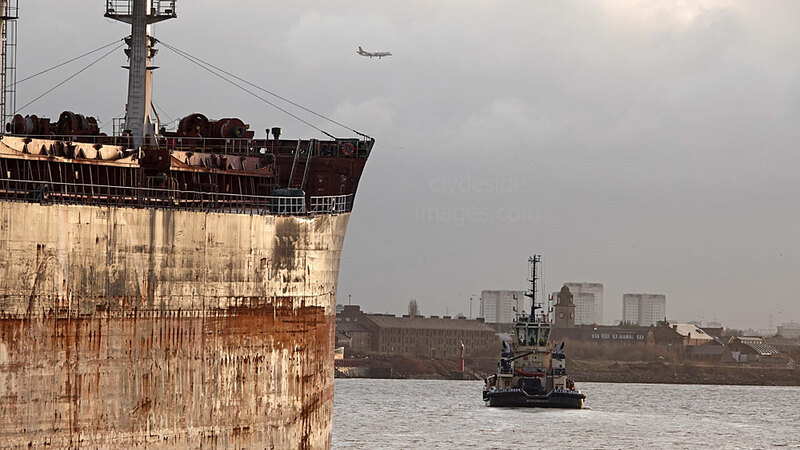 A Loganair Saab 2000 crosses the Clyde on finals as Panamanian-flagged bulk carrier Kmarin Busan makes her way upriver to Shieldhall on 29 January. 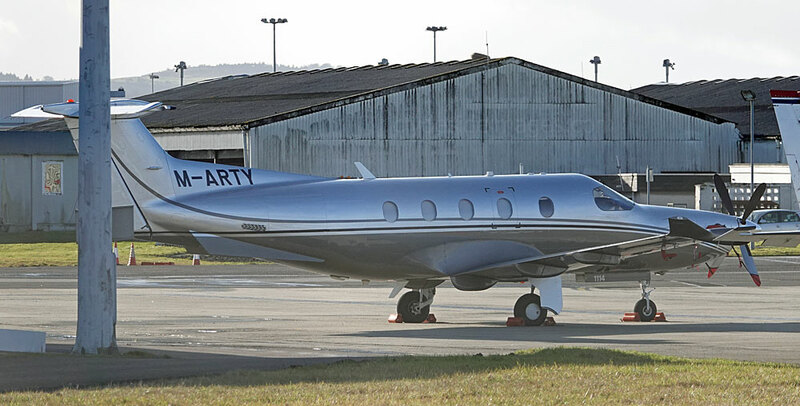 Cessna 680 Citation Latitude CS-LTB of NetJets Europe, routing Cologne-Farnborough, arrived on the 24th and parked on Taxiway Yankee. 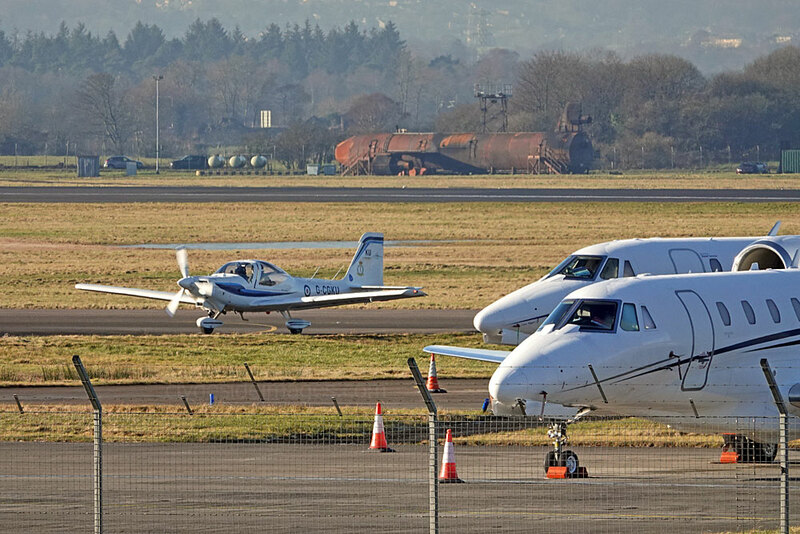 Embraer Phenom 300 G-JMBO (19th); Cessna 680 Citation Sovereign D-CARO (f/v) and Citation II F-HBZA Valljet (22nd); ​Embraer ERJ-135-BJ Legacy 600 G-THFC and Cessna 680 Citation Latitude CS-LTB NetJets Europe (24th); ​Cessna 750 Citation X D-BAVG (f/v) and Citation 680 Sovereign OK-UGJ Travel Service (25th); ​Raytheon Hawker Beechjet 400XP N497XP (28th); Hawker Beechcraft 750 9H-BSA ​(29th); ​Gulfstream (G450) IV-X M-WONE (f/v), ​Cessna Citation III OY-NLA North Flying, plus Citation Sovereign OK-UGJ and Beechjet 400A both returned (30th); Cessna ​CitationJet CJ3 N181KA (f/v) and Citation CJ2+ D-IAKN (f/v) (31st). 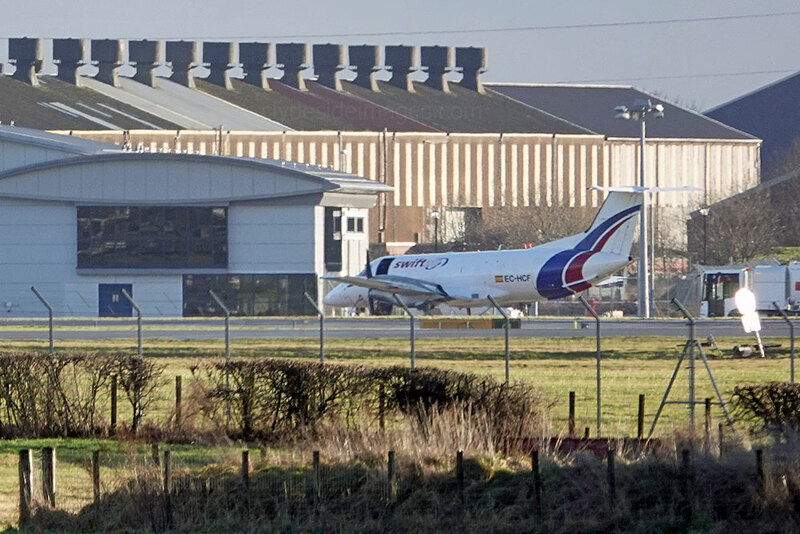 ​Cessna Citation III OY-NLA of North Flying (above) and Manx-registered Gulfstream IV-X M-WONE both arrived late morning on Tuesday 30 January. 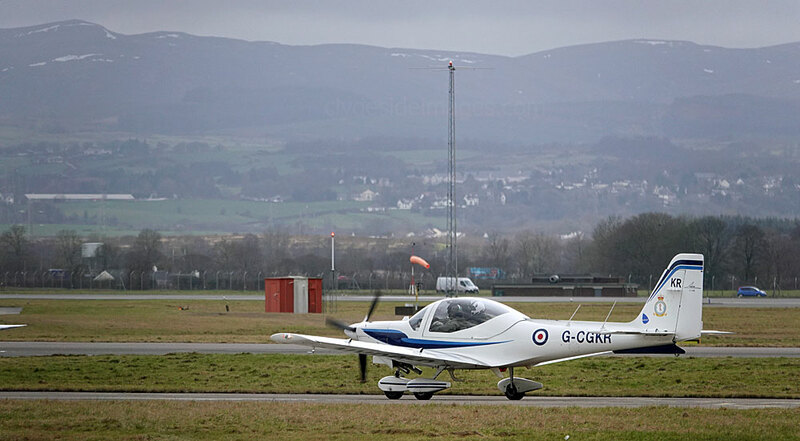 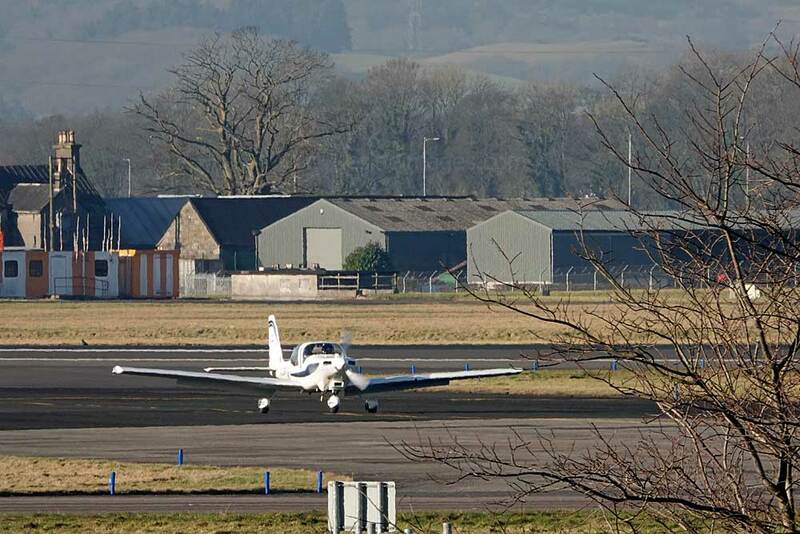 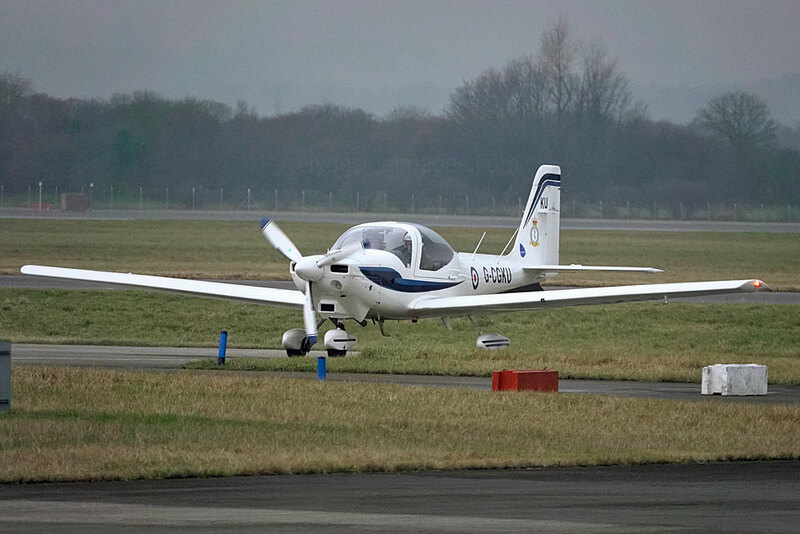 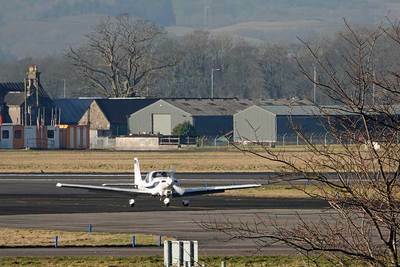 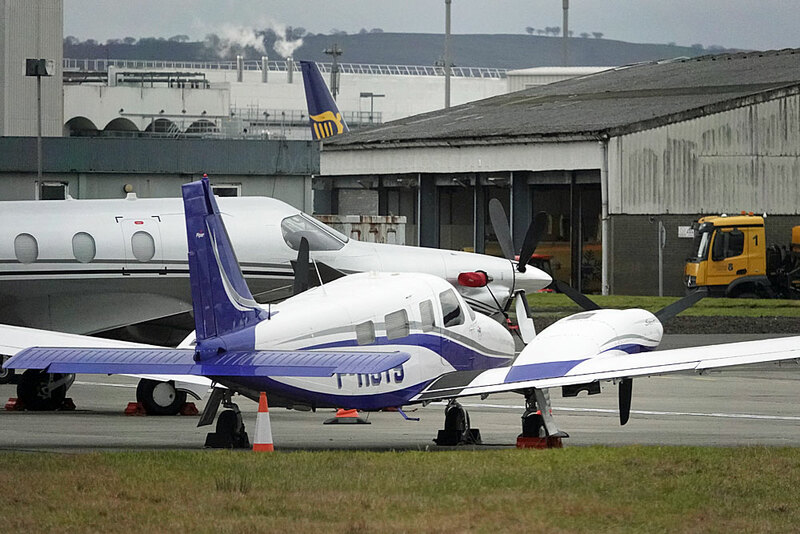 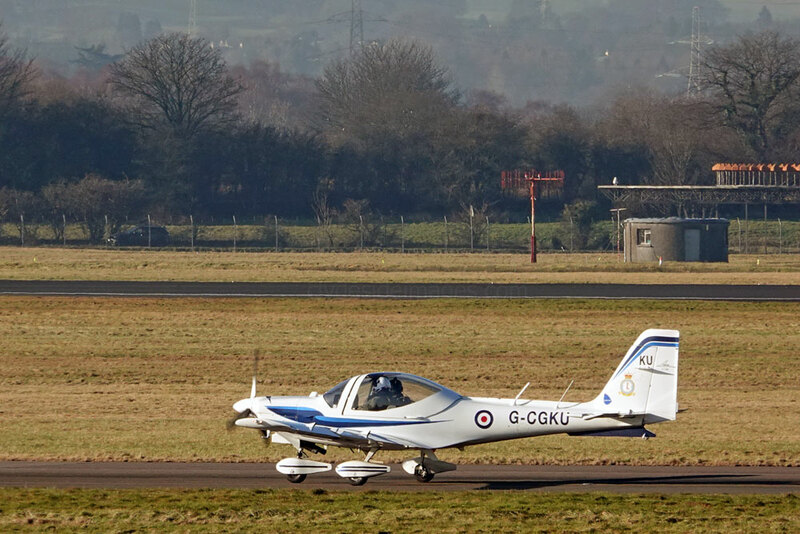 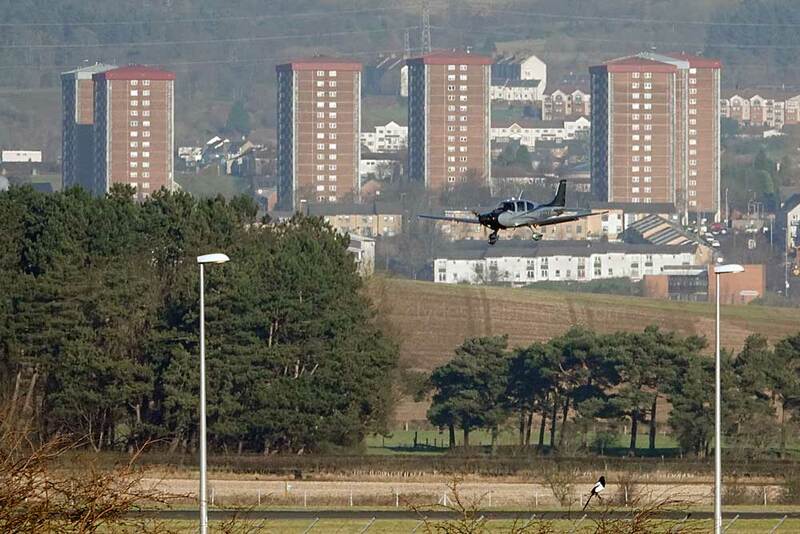 The first SOCATA Tecnam to stop-off at Glasgow during its delivery flight this year was TBM 930 N930ZD, seen here on Area Juliet on Saturday 6 November. 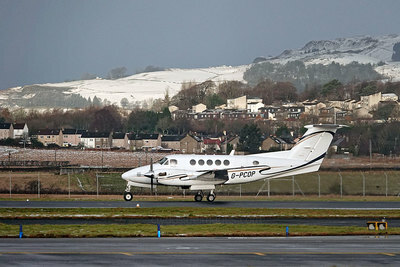 The crew spent the night at a nearby hotel before continuing to Keflavik on the next stage of their journey. 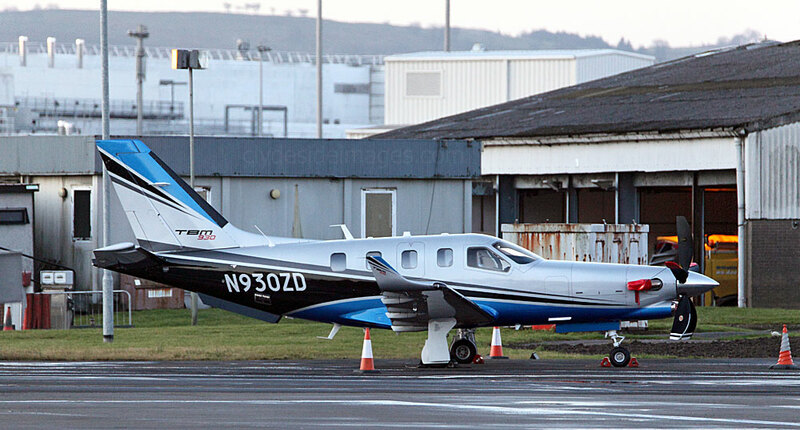 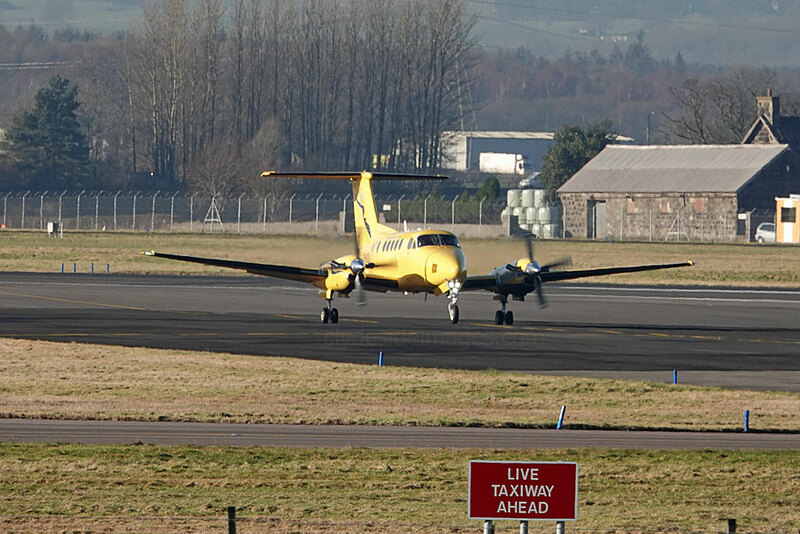 Manx-registered Pilatus PC-12 M-ARTY, on a round trip from East Midlands, arrived on the 28th. 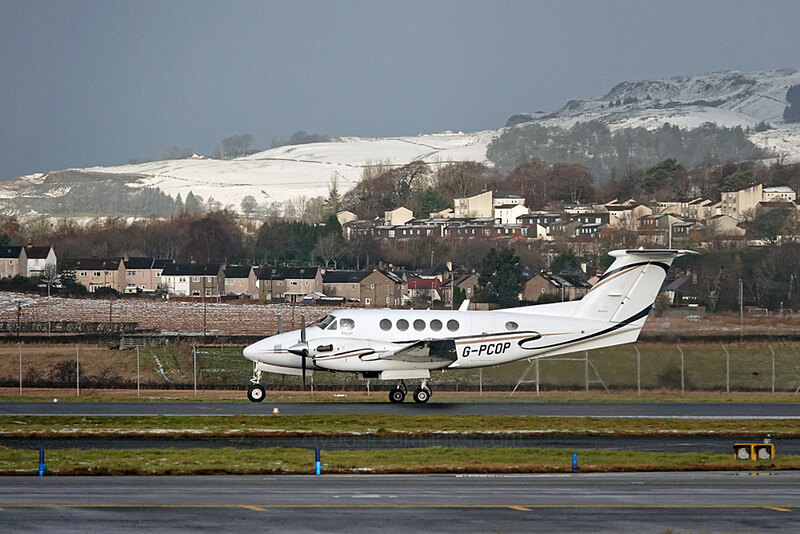 ...and a few to finish the month, namely ​King Air 200s M-WATJ and G-WNCH plus Piper PA-34 Seneca F-HSYS (30th); ​Sikorsky S-76C G-ROON (f/v) (31st). 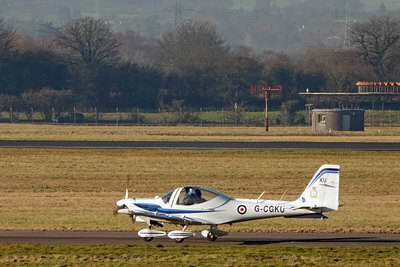 Grob G.115E Tutor G-CGKR of the University Air Squadron (UAS). 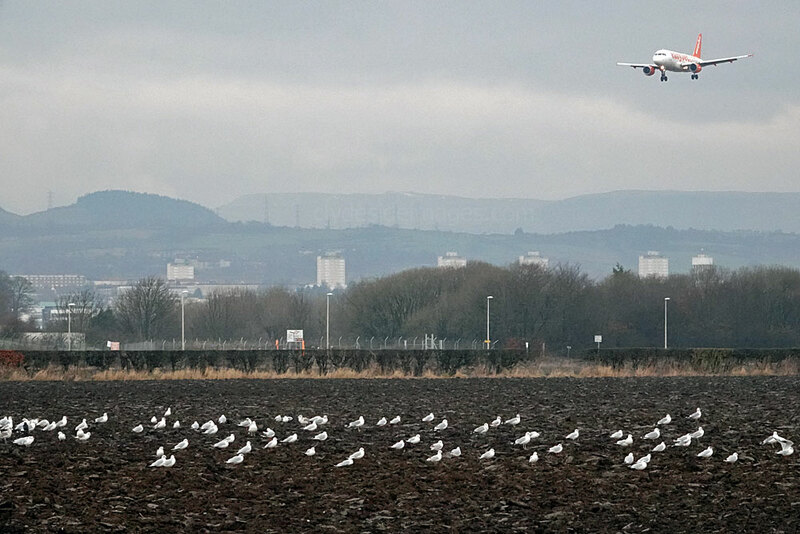 ​As a result of RAF Mildenhall winding down for the New Year break from December 27th onwards, USAF KC-135R tankers crossing the `Pond` routed through Prestwick. 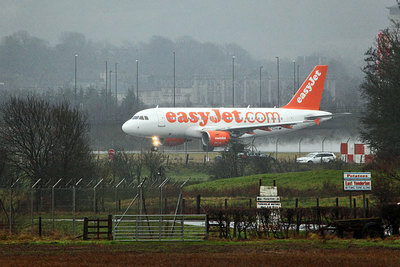 There were 8 on Monday 1 January and no less than 10 recorded on the 2nd, most of which departed the next day. 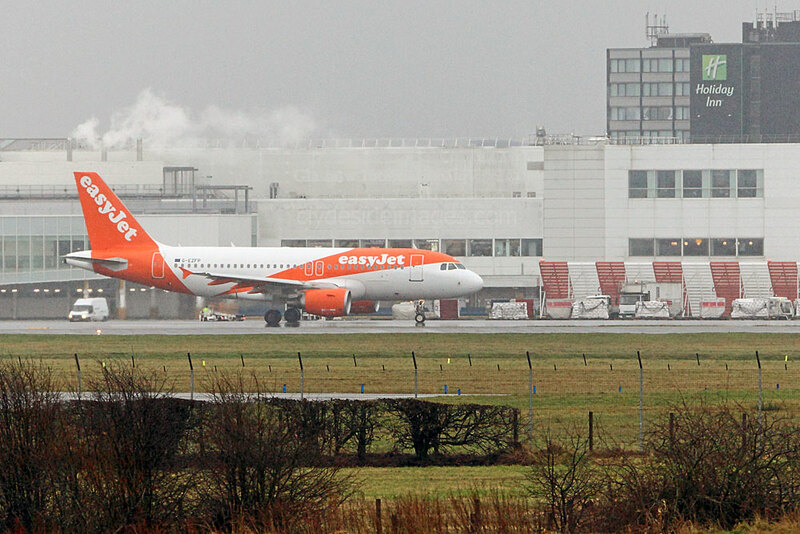 ​Back at Glasgow, the first military movement of 2018 was German Air Force Airbus A319-133(CJ) serial number 15+01 which did a touch-and-go at 14:00 hrs on Sunday 14 January. 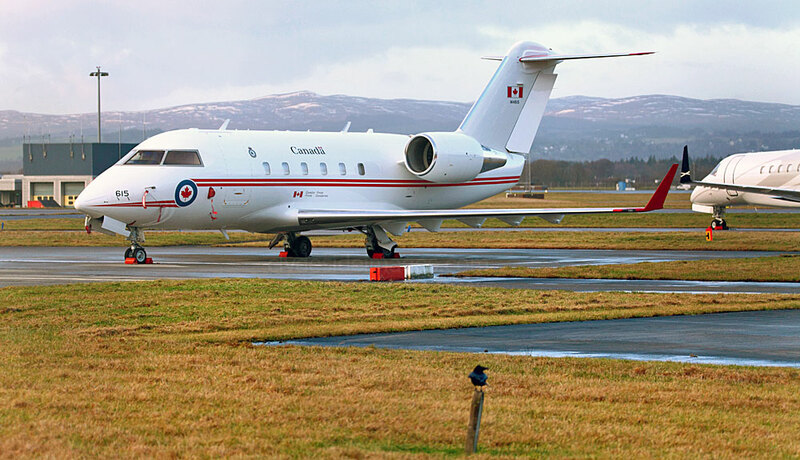 Royal Canadian Air Force Canadair CC-144 Challenger serial number 144615 touched down at 20:15 hrs on Tuesday 23 January and night-stopped on Area Juliet during a trip between Goose Bay and Luton. 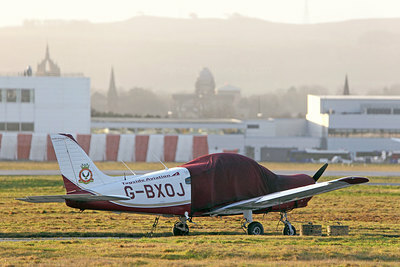 This aircraft is one of six belonging to No. 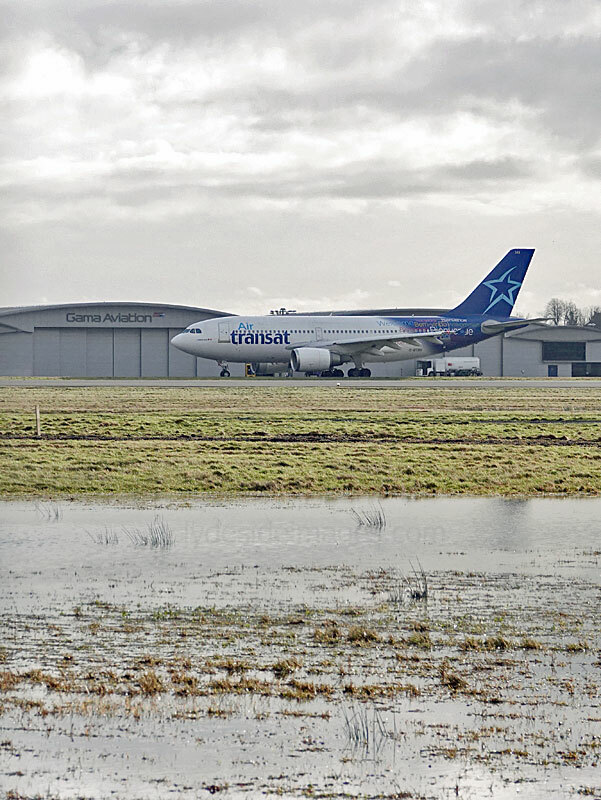 412 Transport Squadron, one of three RCAF transport squadrons attached to CFB Trenton in Trenton, Ontario. 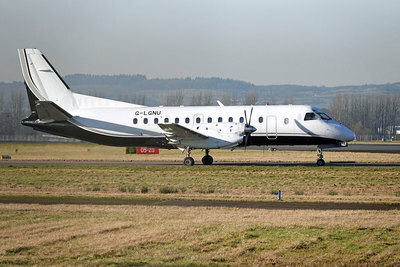 The unit began as a RCAF squadron during the Second World War flying Spitfires but reformed as a Transport Squadron in 1949. 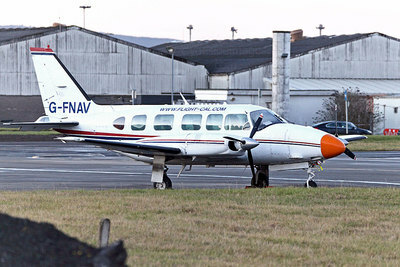 Following the closure of CFB Ottawa (Uplands) in 1994, 412 Sqn's fleet was moved to a civilian hangar at Ottawa International Airport where all aircraft are now maintained by Transport Canada on behalf of the Canadian Armed Forces. Today, the unit`s main role is to provide executive transport for the Governor General of Canada, high level government officials, plus HM Queen Elizabeth ​and foreign VIPs while they are in Canada. 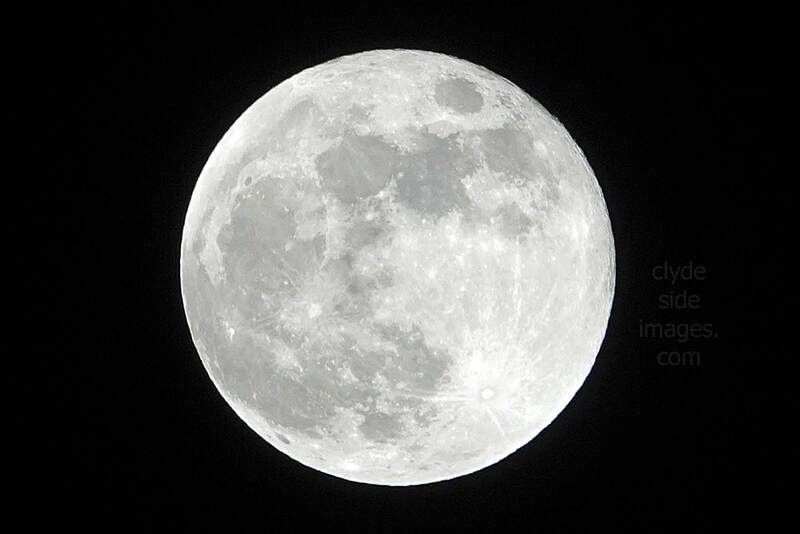 On the last night of the month, a lunar eclipse, supermoon and a blue moon all coincided for the first time since 31 March 1866 although you had to be in either Australia, Asia, some parts of the US or Eastern Europe, to experience the lunar eclipse, as the Earth passed between the Sun and the Moon. 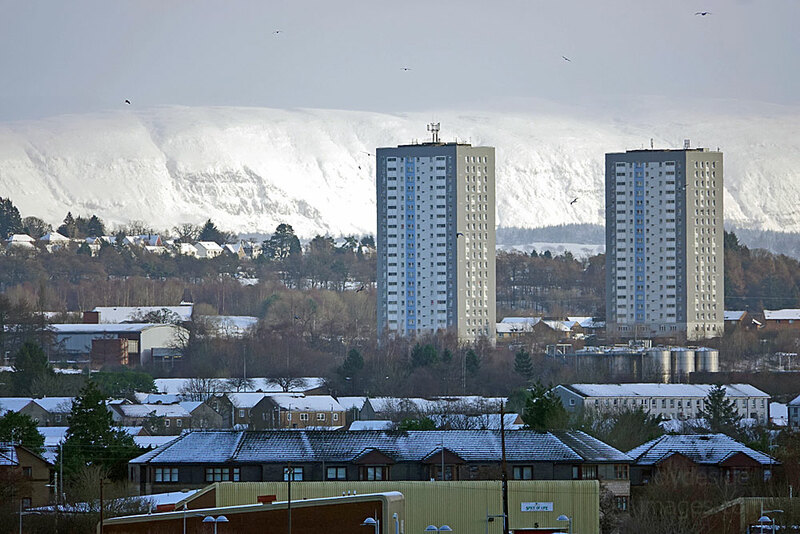 The one on the 31st, which I photographed from my garden in Erskine at 21:00 hrs, was the second supermoon of the month after the year's first full moon, called the Wolf Moon, on 2 January.